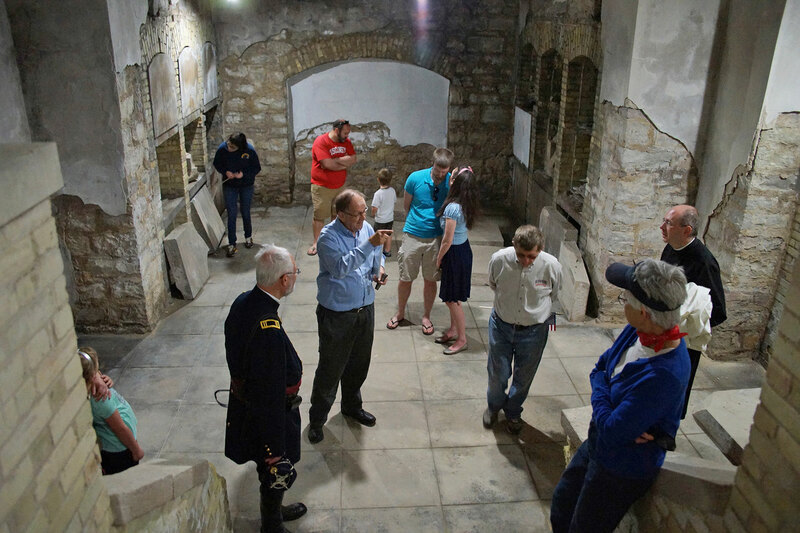 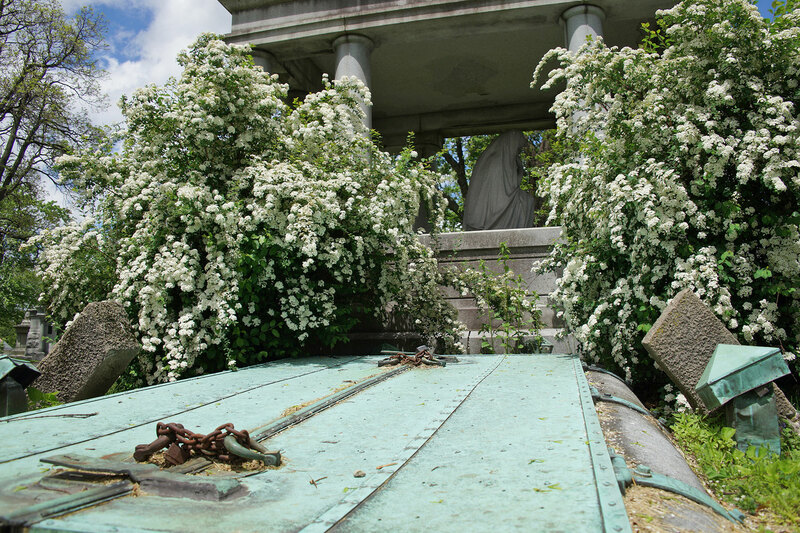 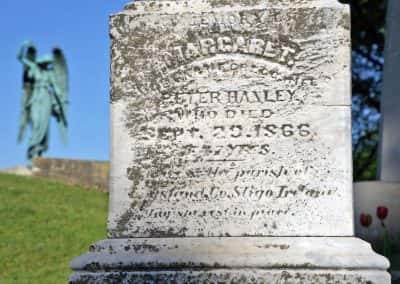 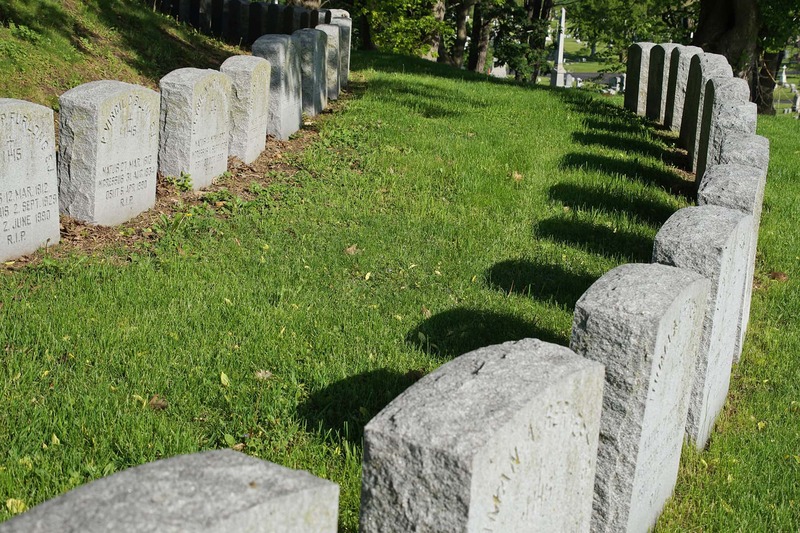 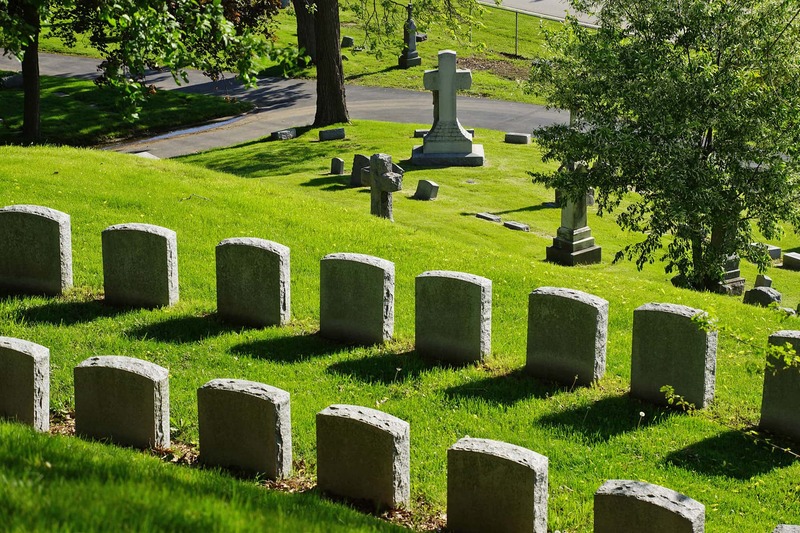 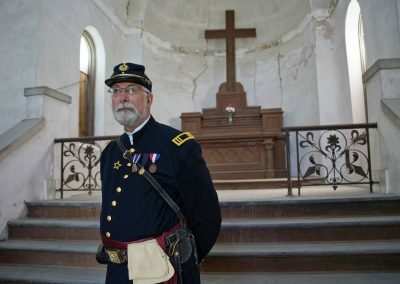 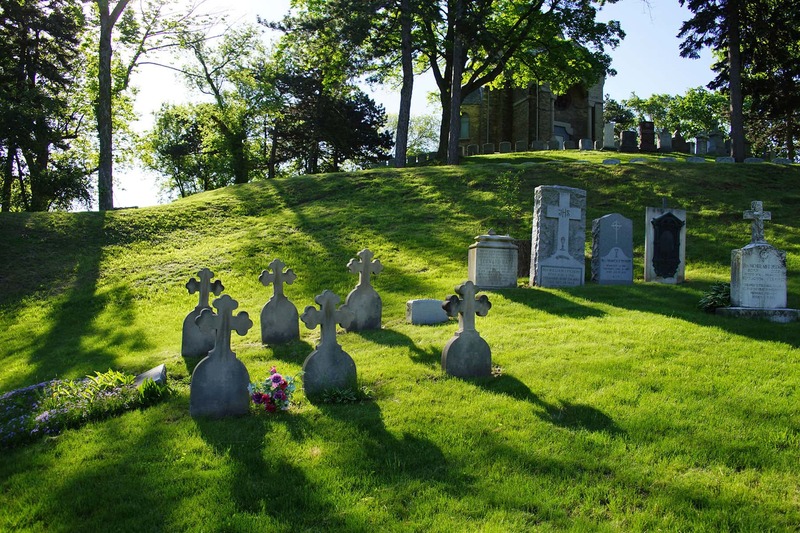 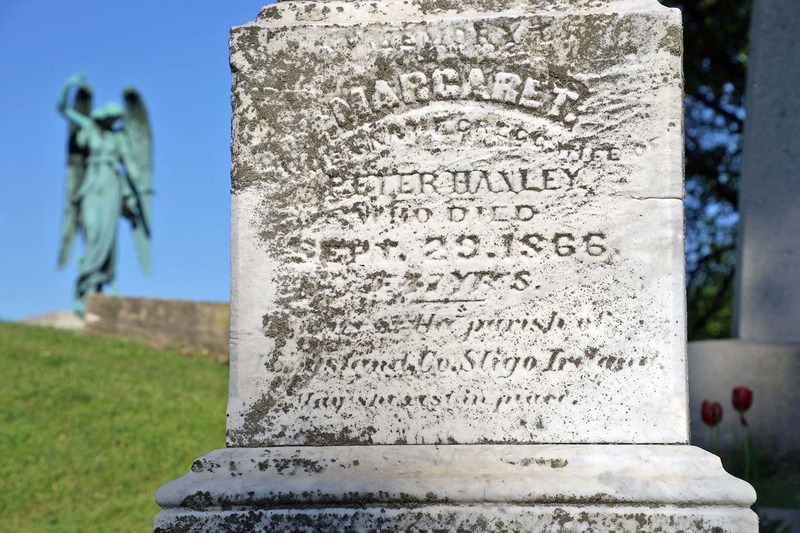 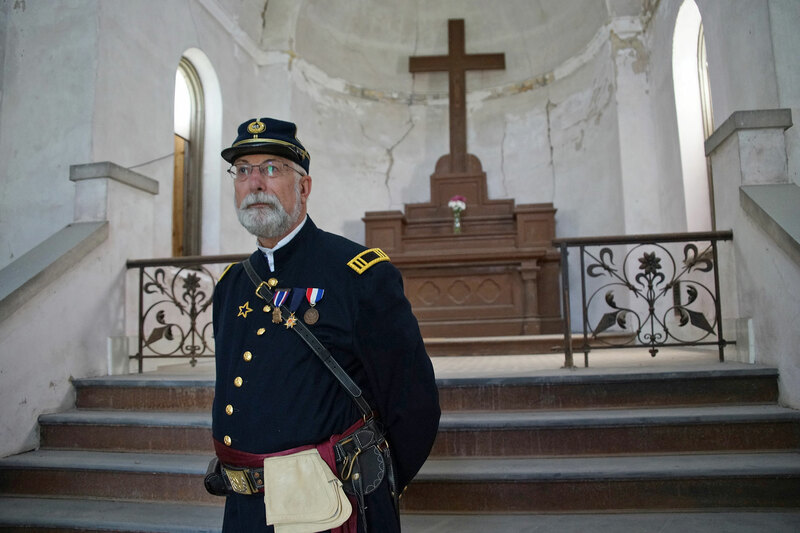 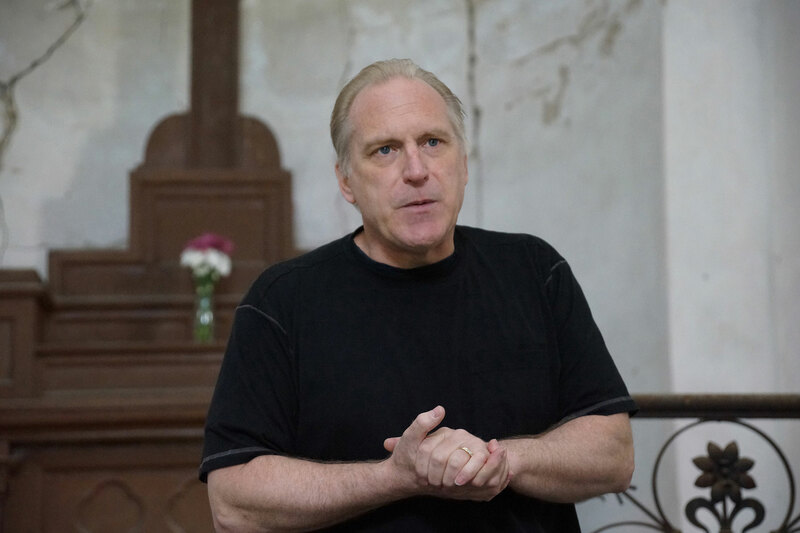 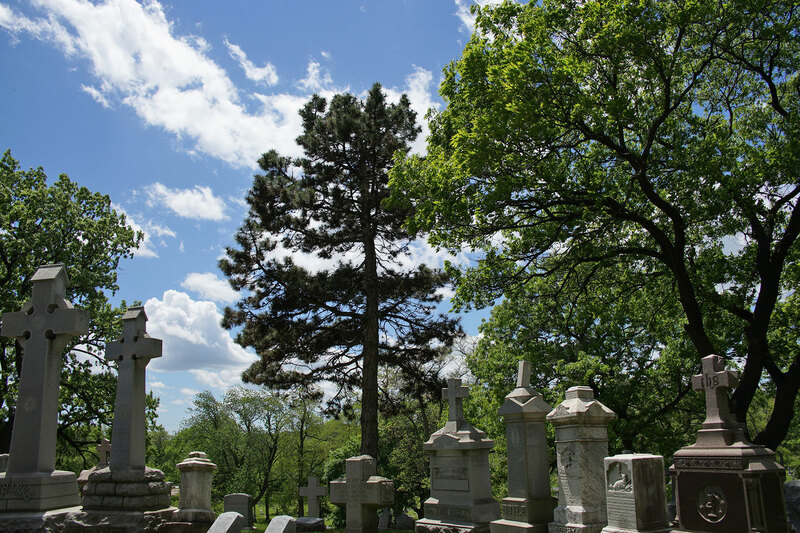 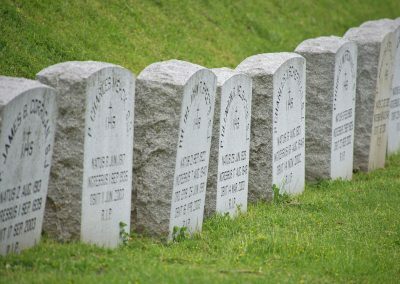 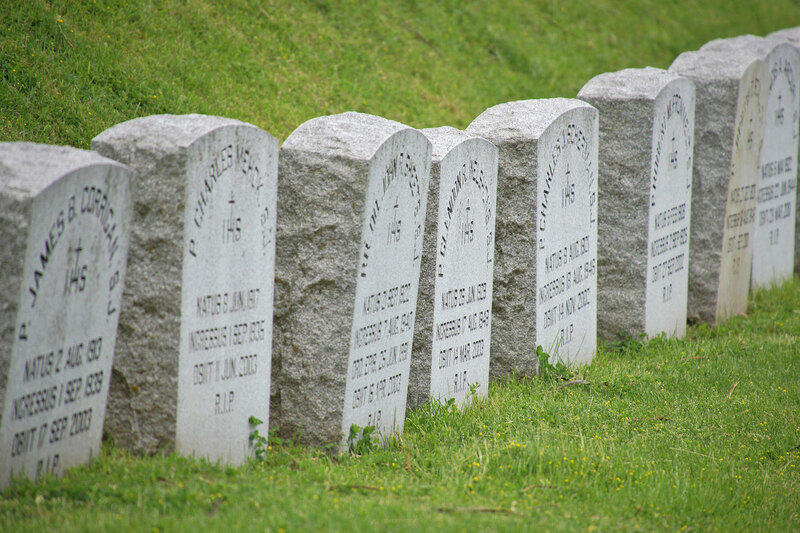 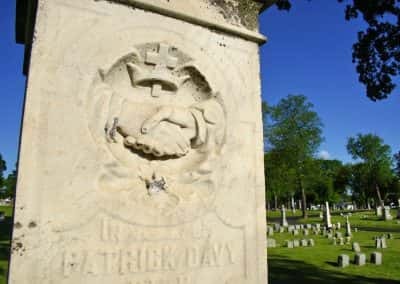 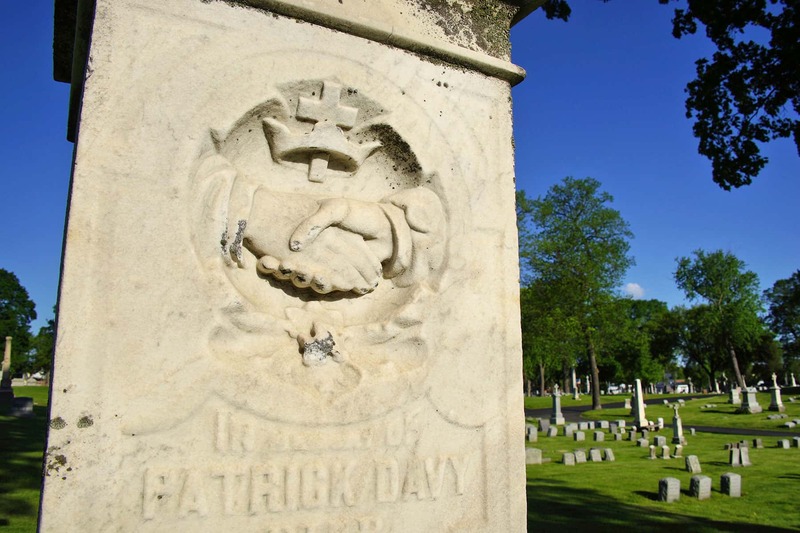 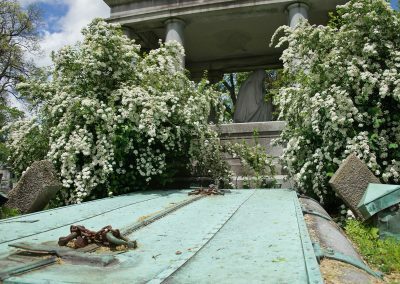 After the morning mass and Civil War era Memorial Day festivities, the historic Calvary Cemetery Chapel was briefly opened for a rare public tour. 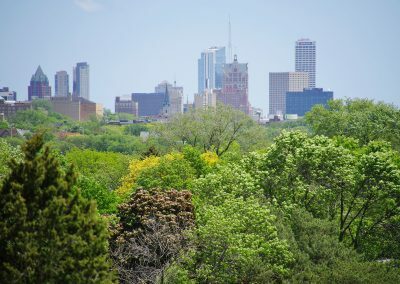 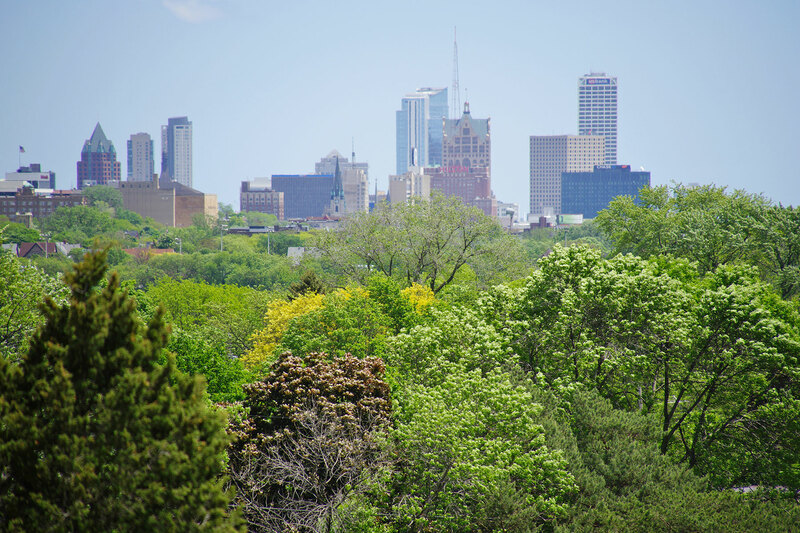 The hilltop is known as the highest natural elevation in Milwaukee, and the vantage point commands an amazing view east to Lake Michigan. 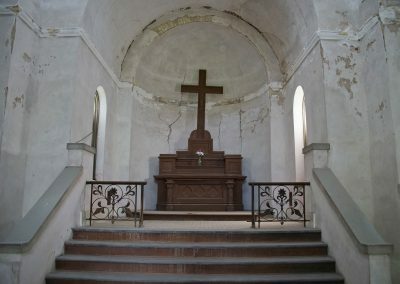 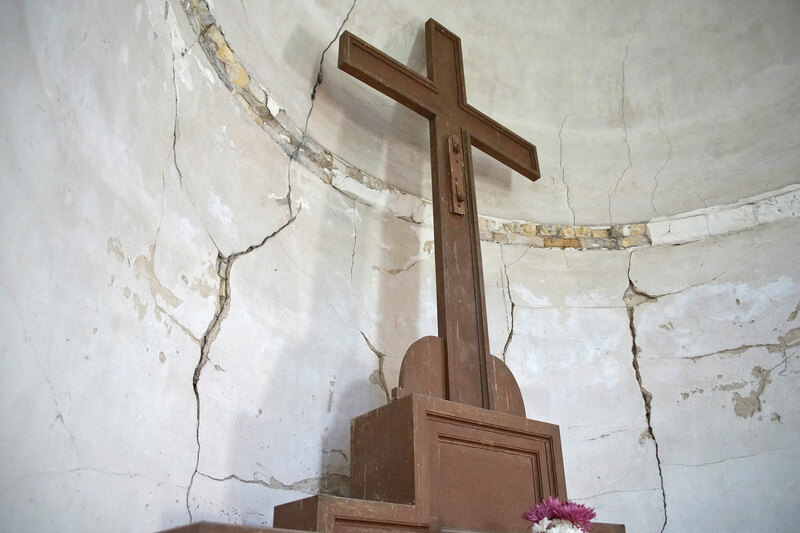 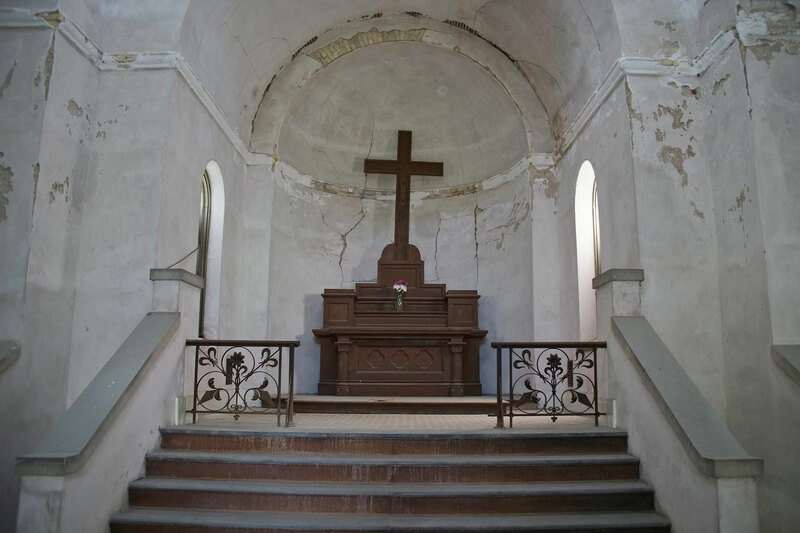 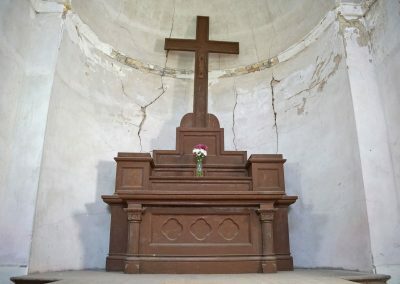 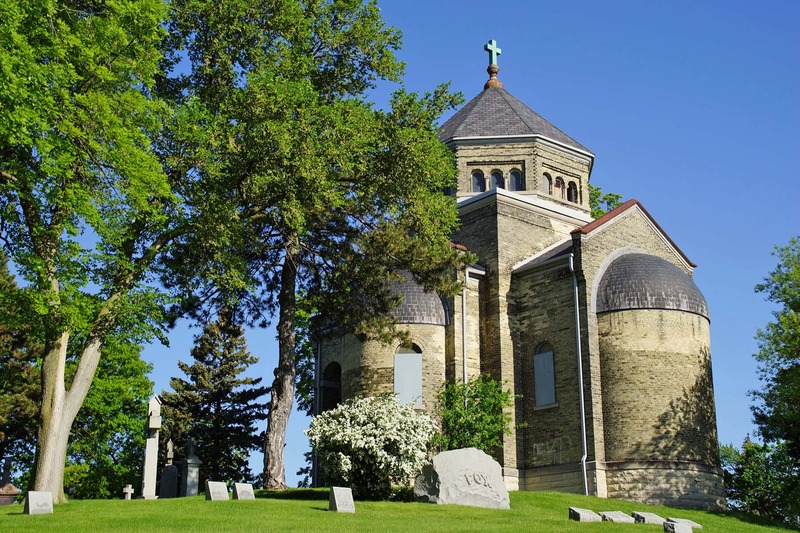 Built in 1899 and replacing a longstanding solitary cross, usage of Calvary Chapel was limited to annual Catholic masses like All Saint’s Day, and later Memorial Day vigils. 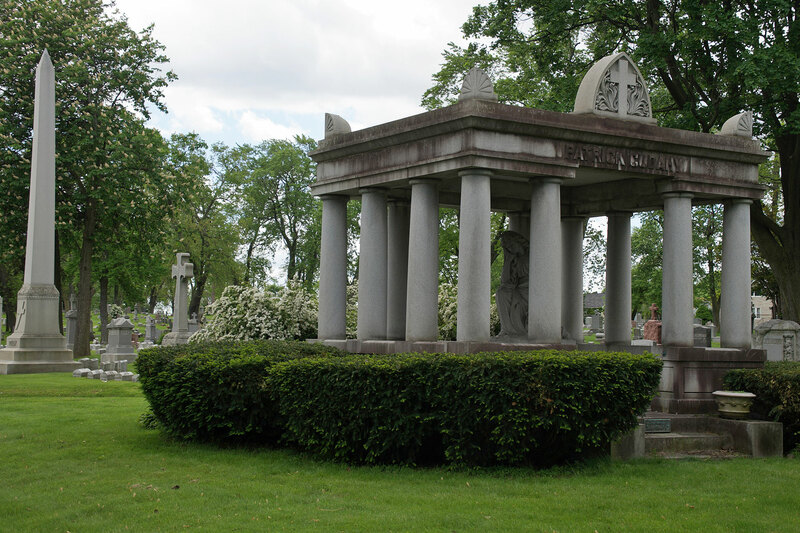 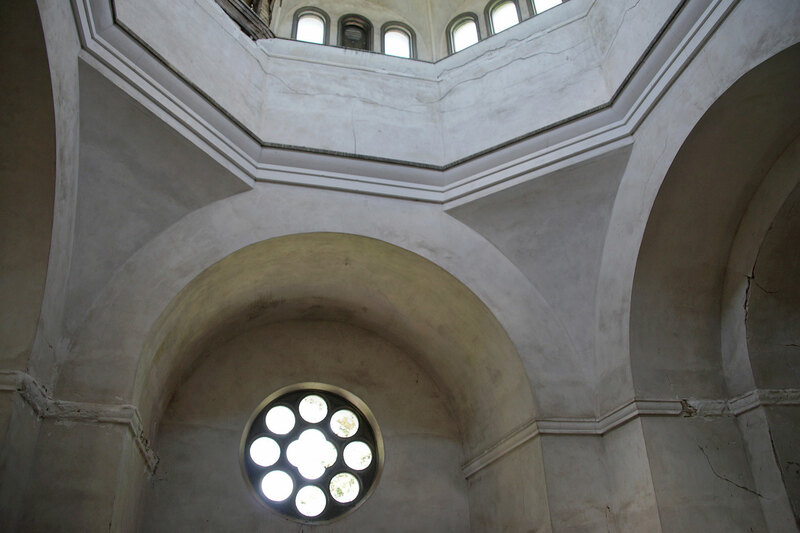 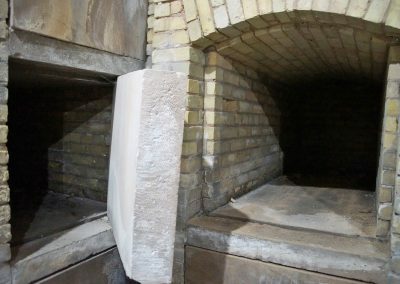 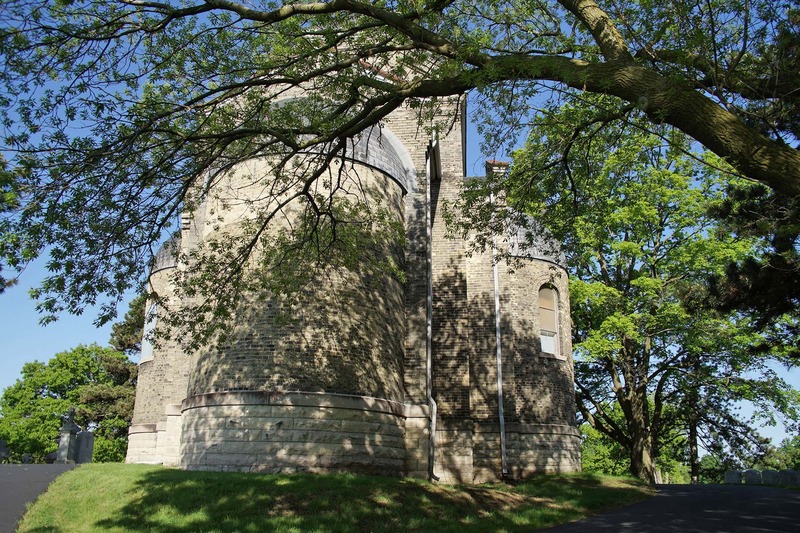 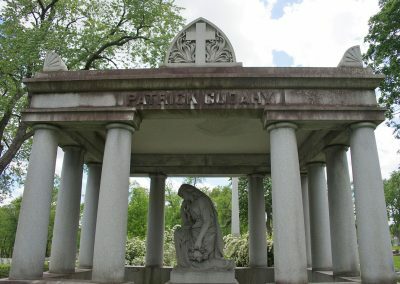 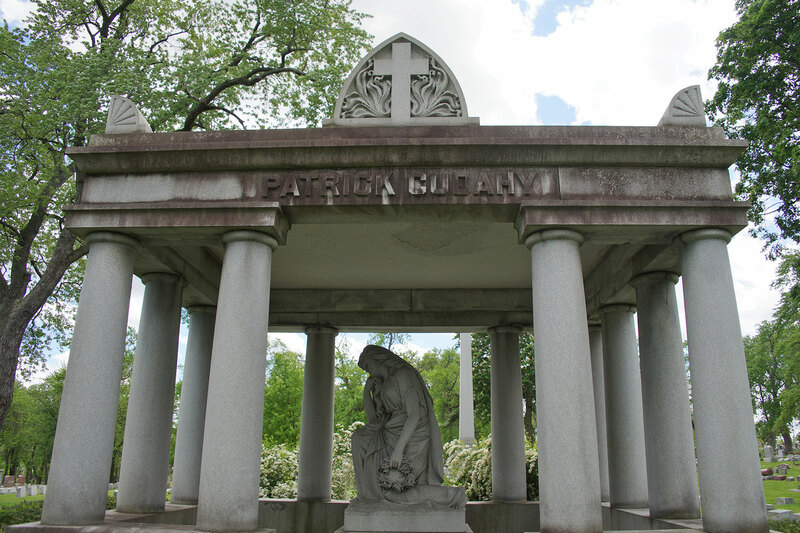 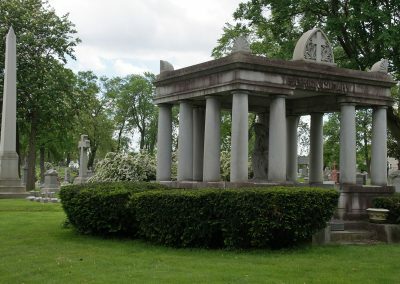 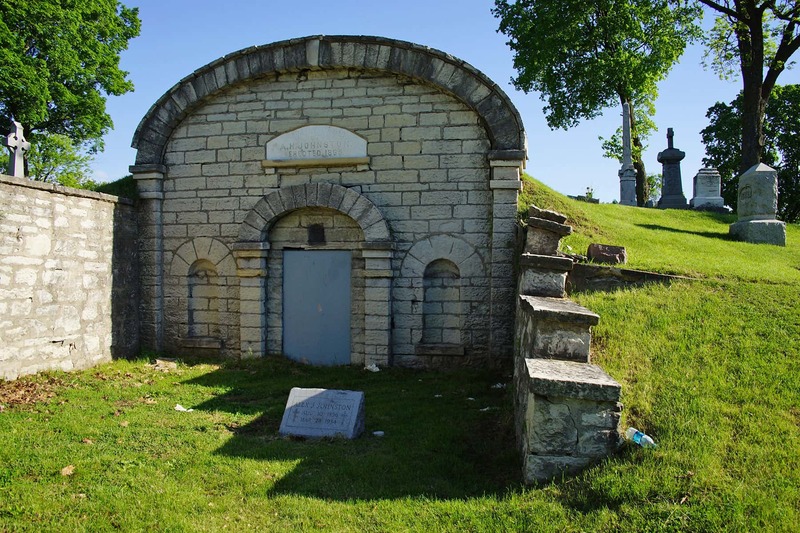 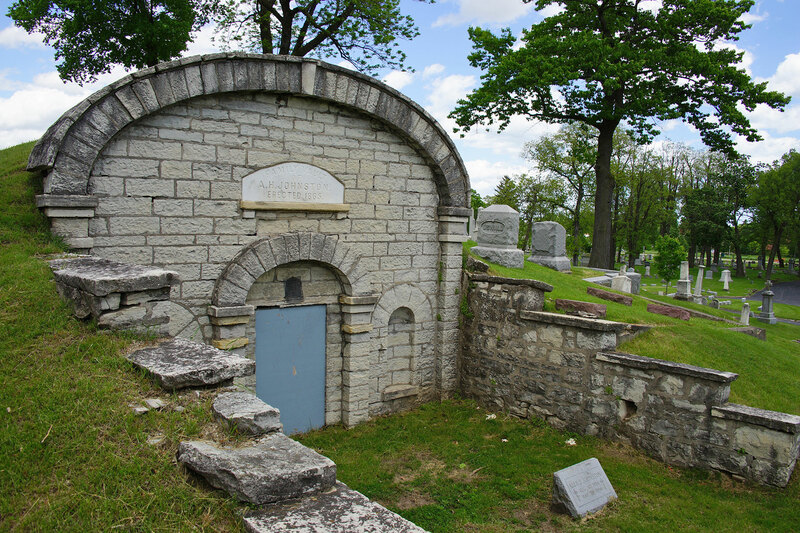 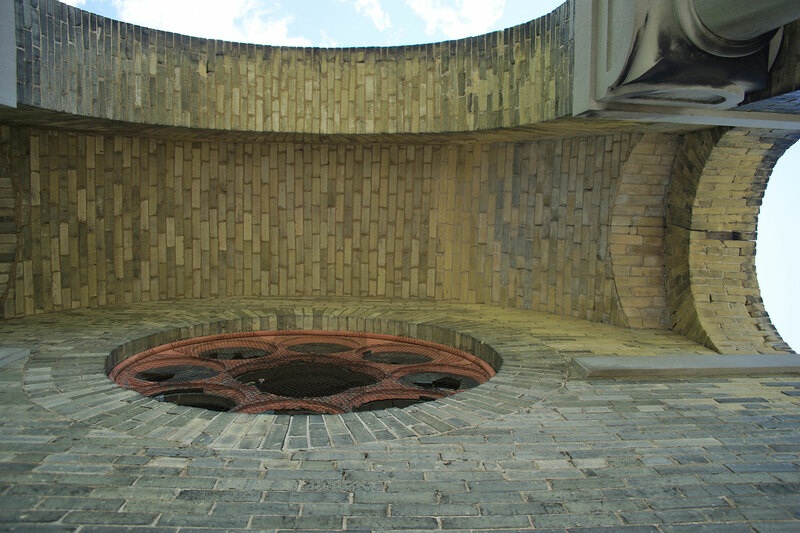 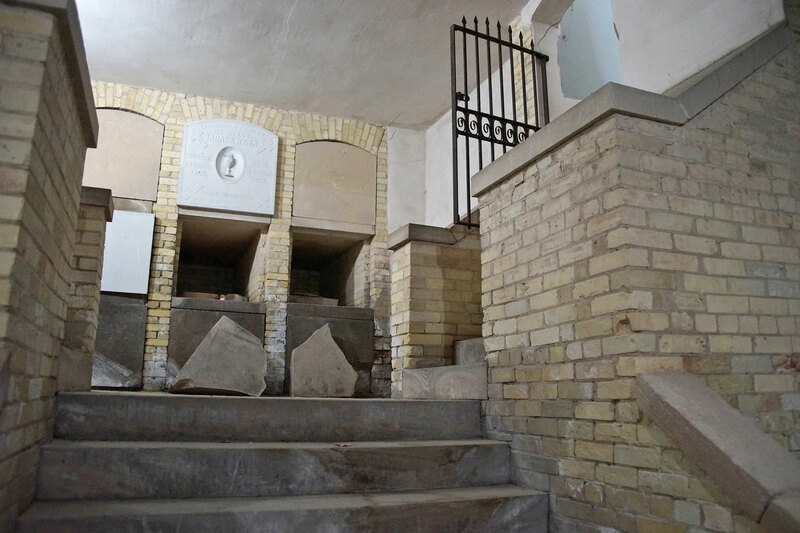 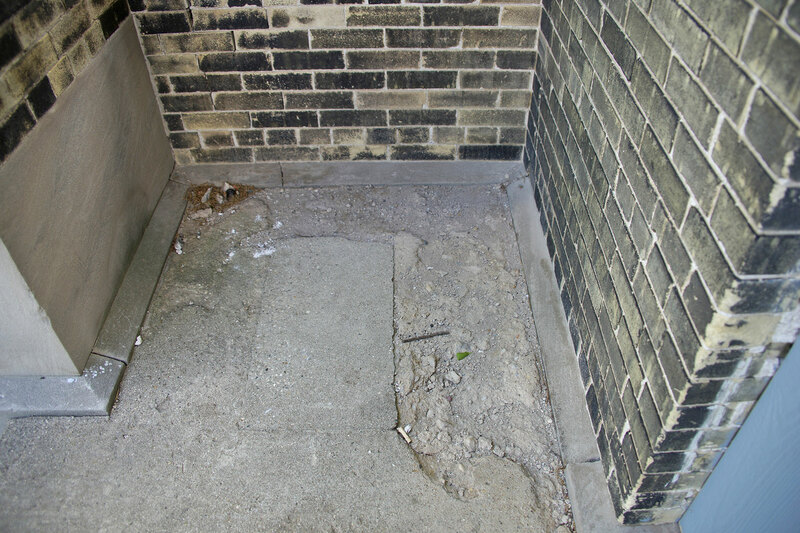 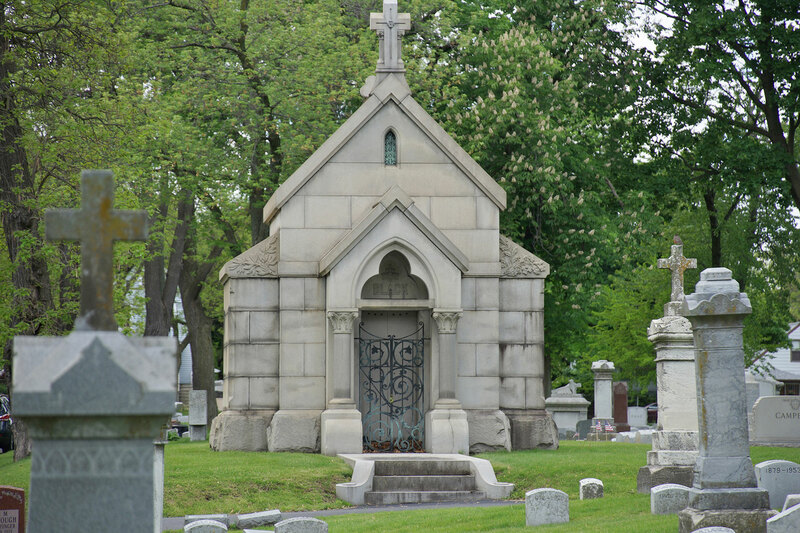 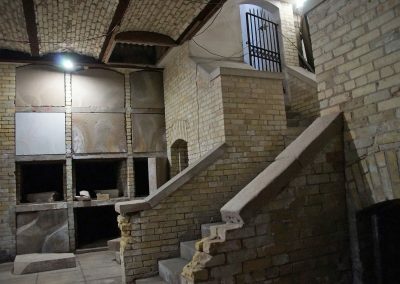 The two level structure was intended for services, prayer, private contemplation, and also as a mausoleum for clergy. 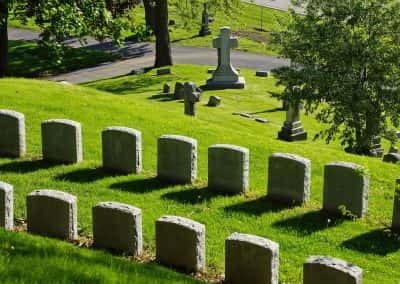 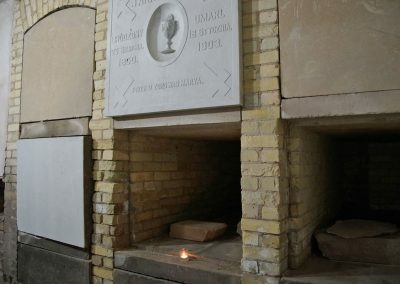 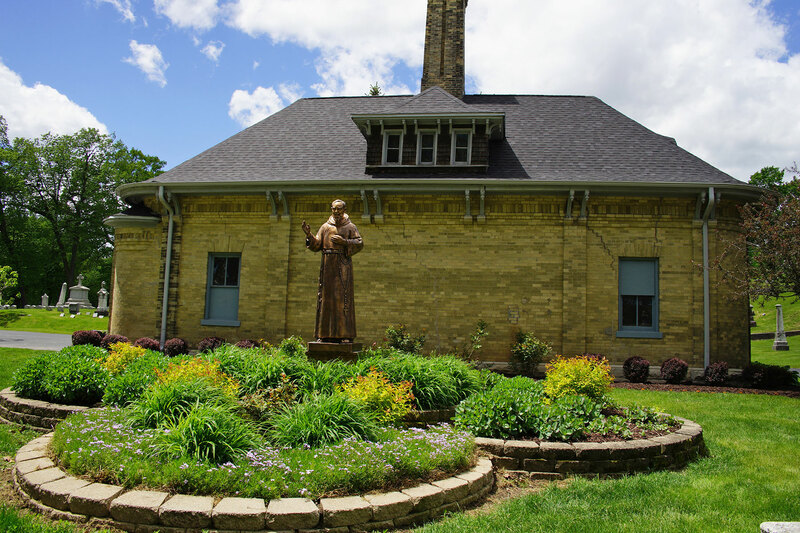 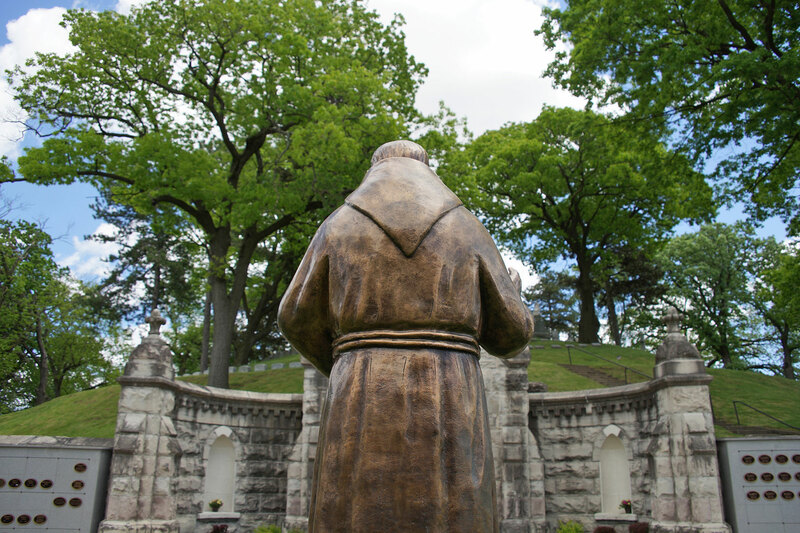 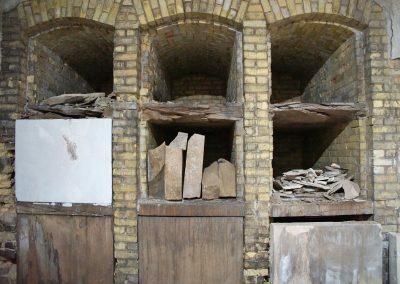 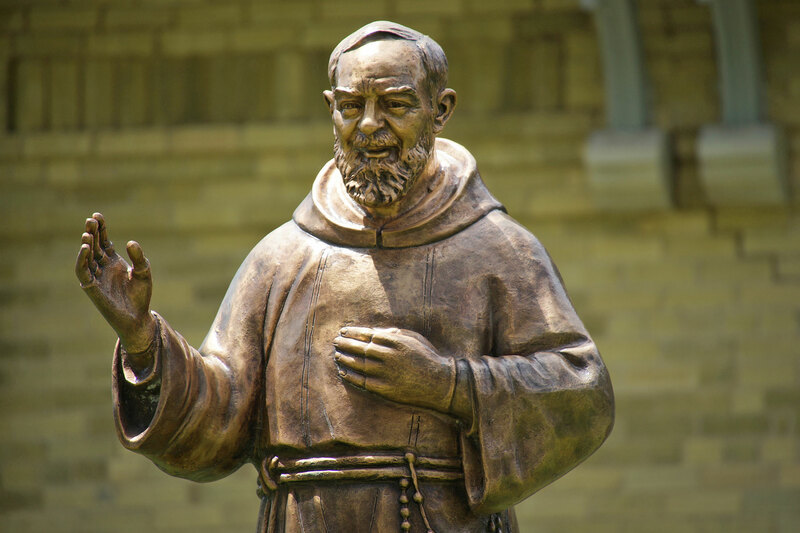 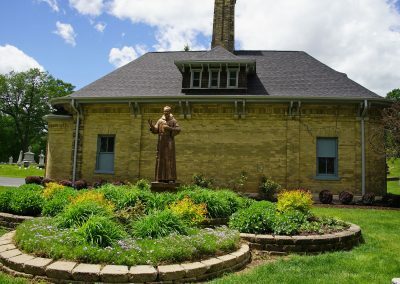 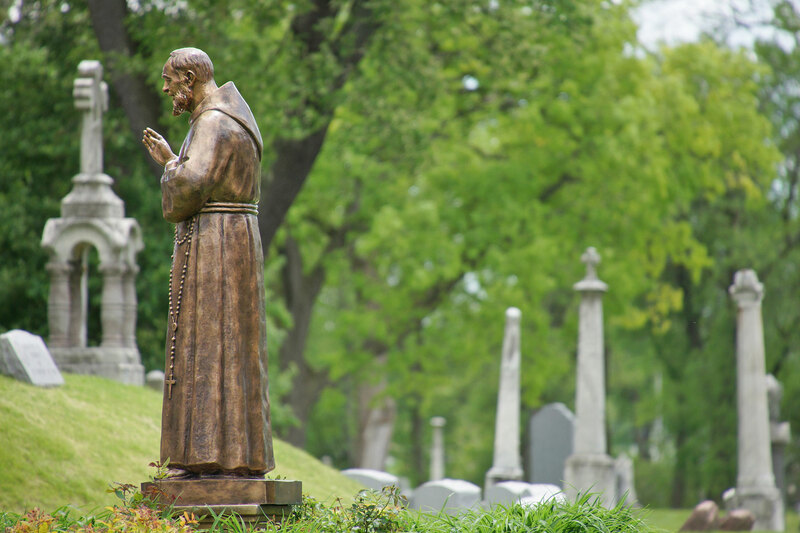 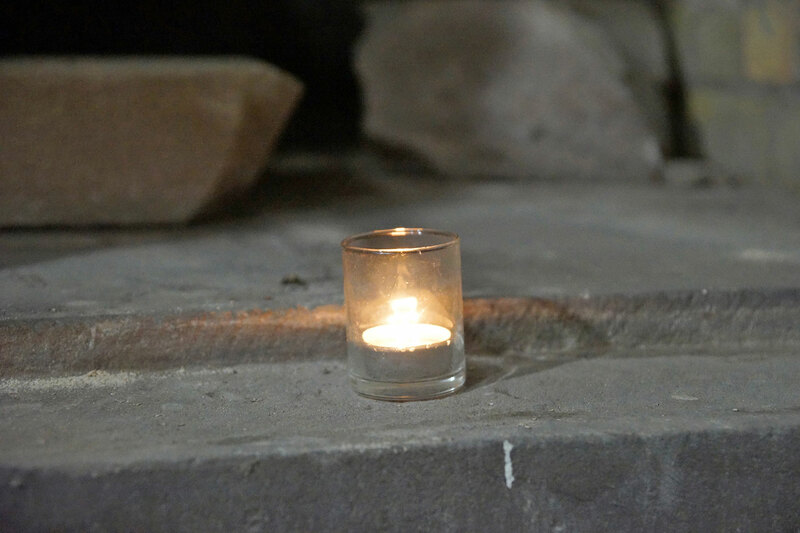 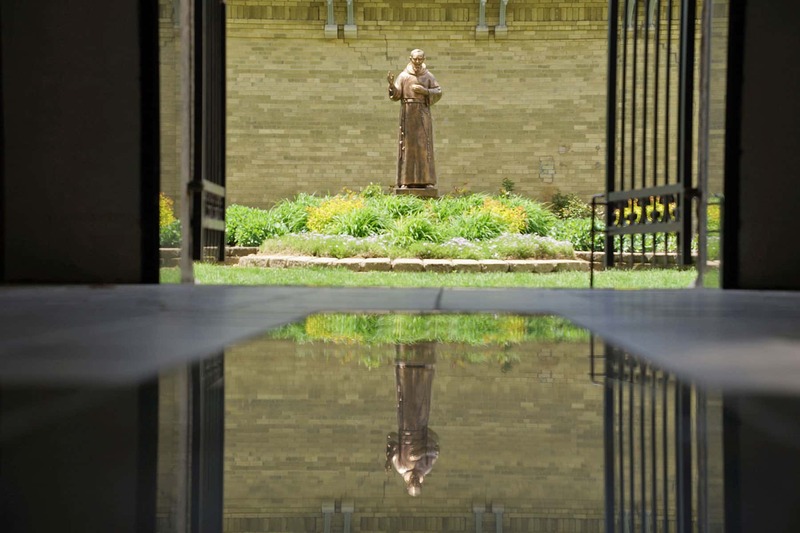 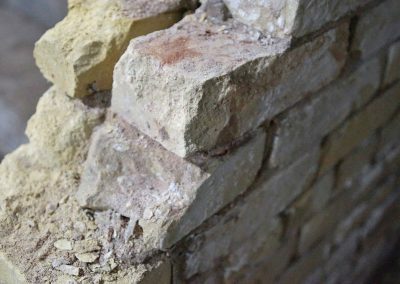 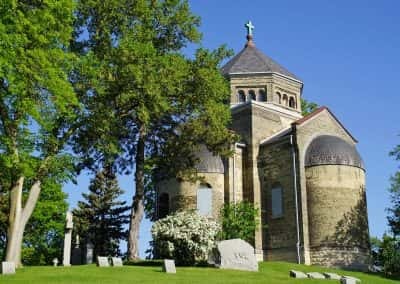 But while around the hillside are interred faithful clergy, exactly 225 Jesuits, only a single soul rests within the Romanesque Cream City Brick structure. 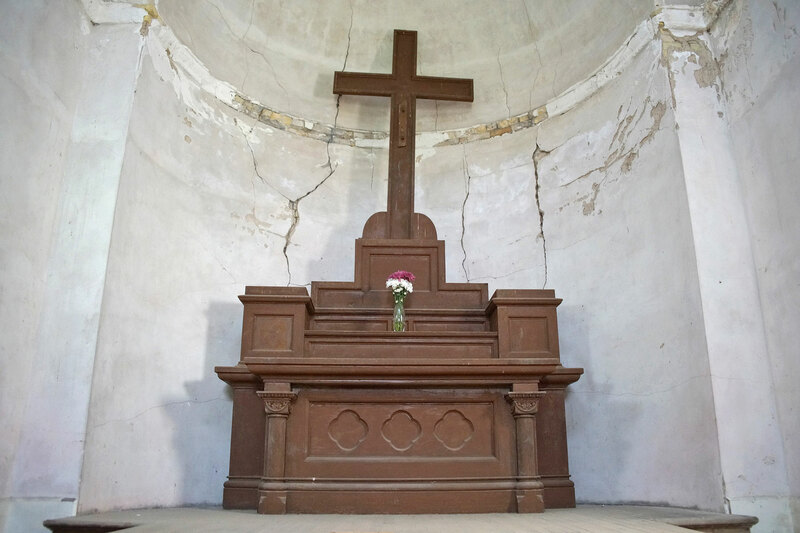 Reposing directly beneath the main altar is the body of Reverend Idziego Tarasiewicza, interred in 1903. 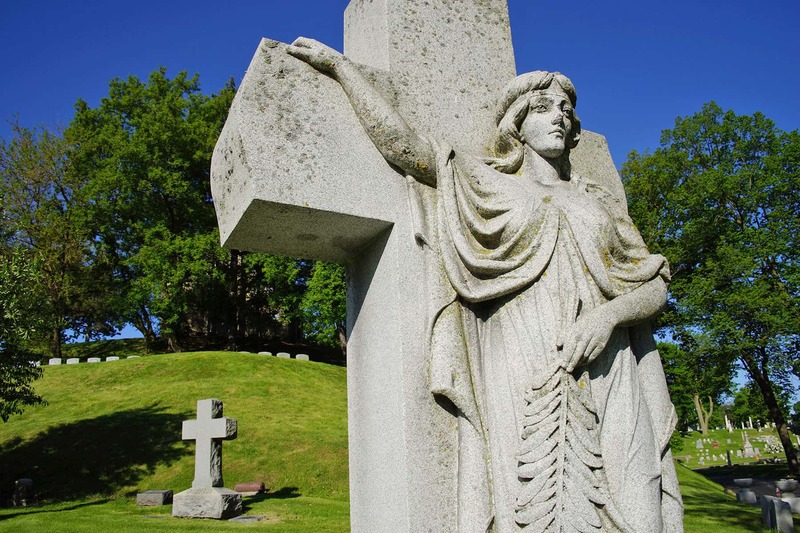 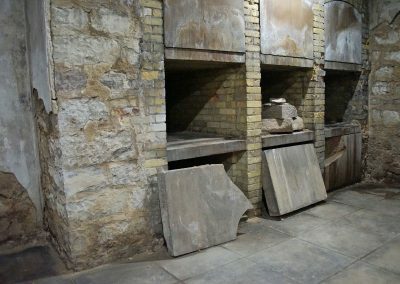 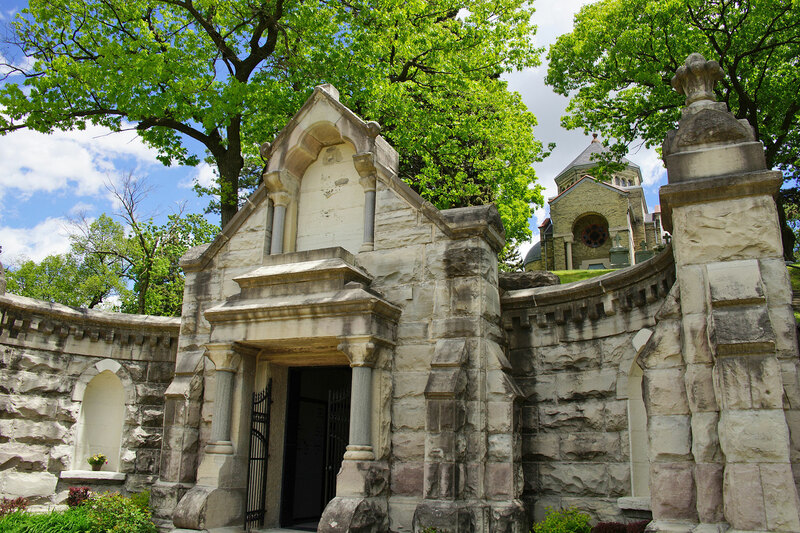 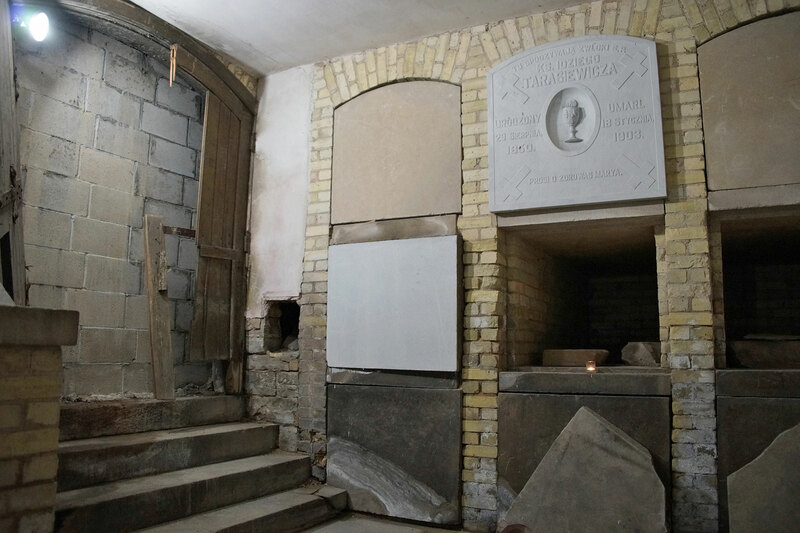 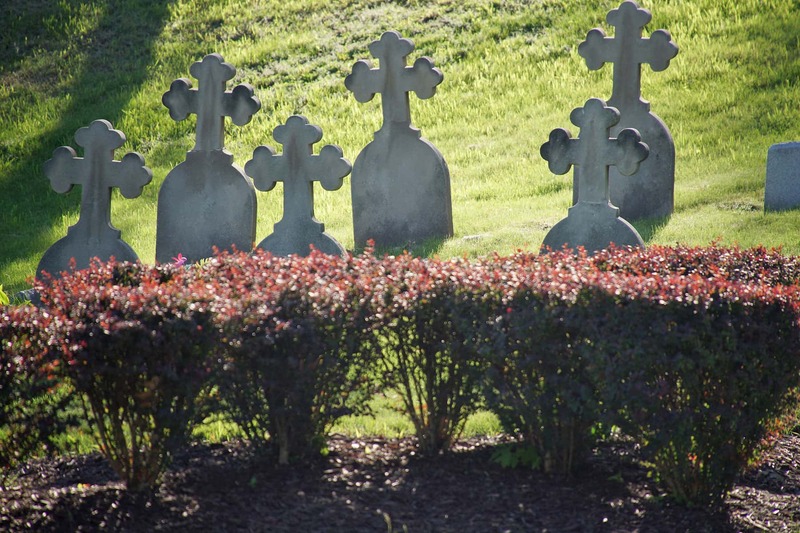 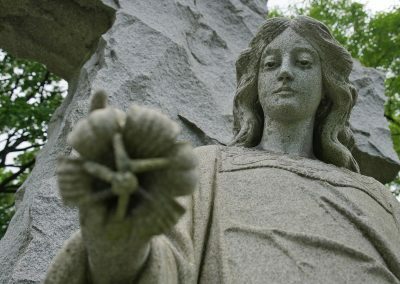 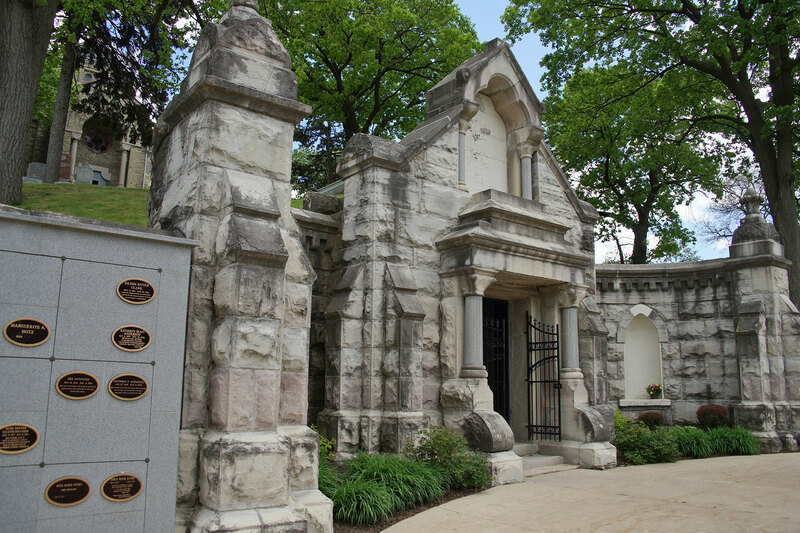 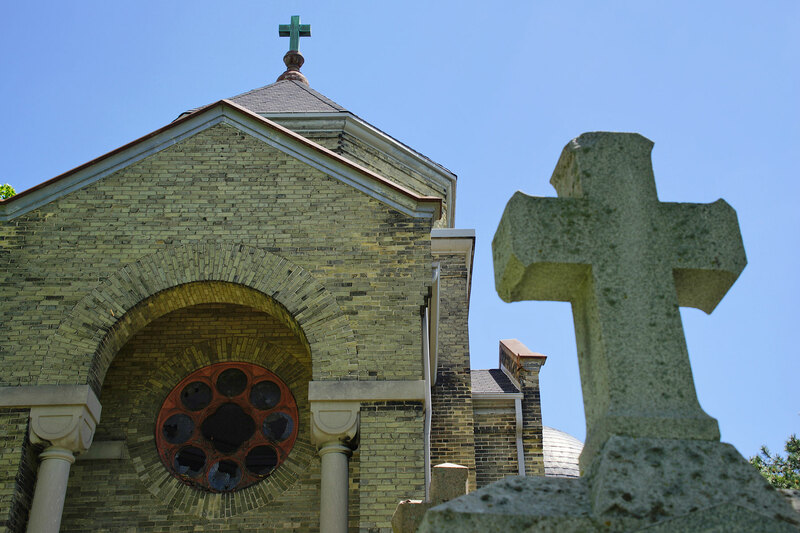 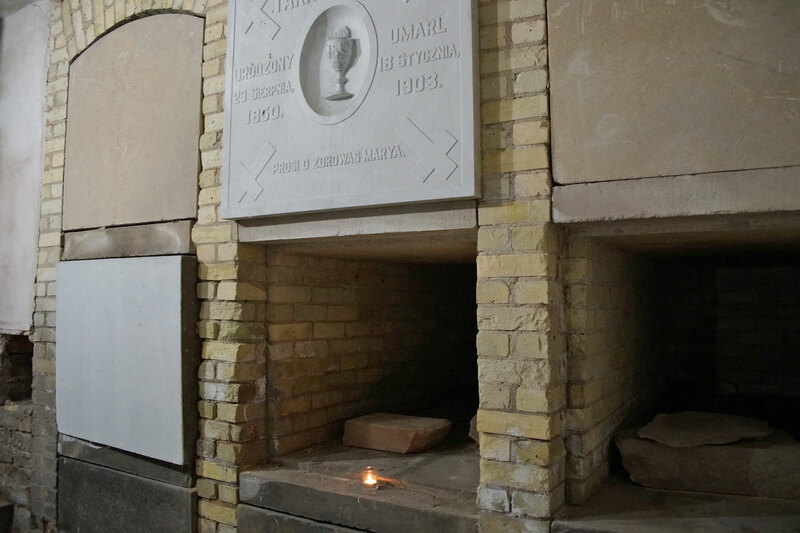 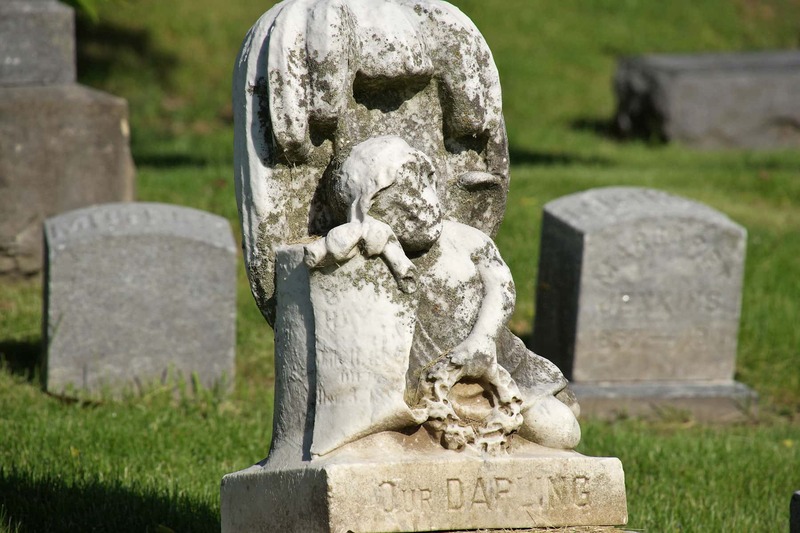 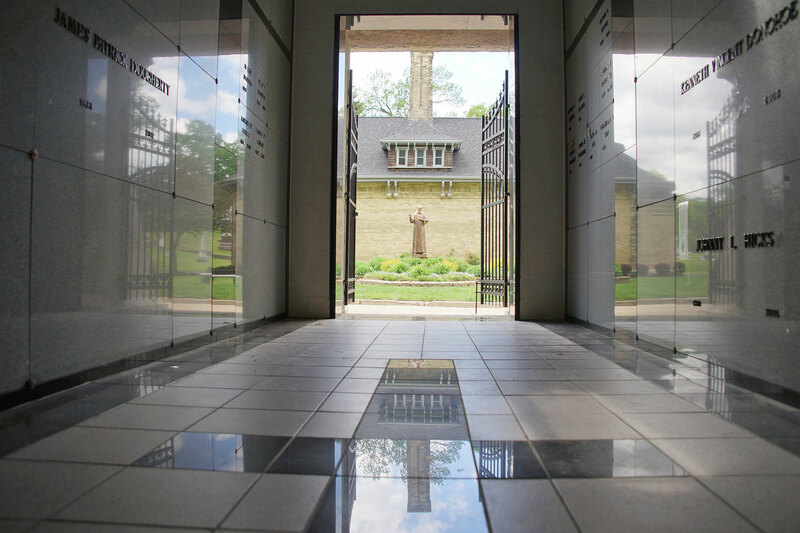 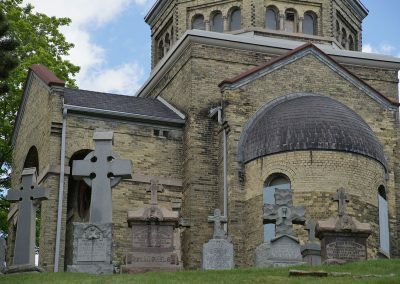 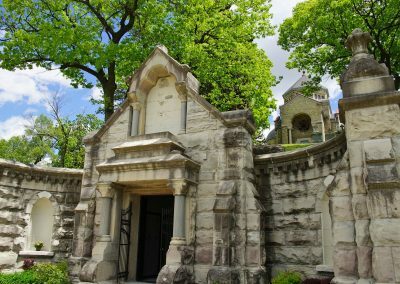 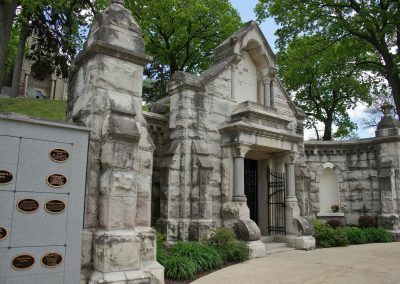 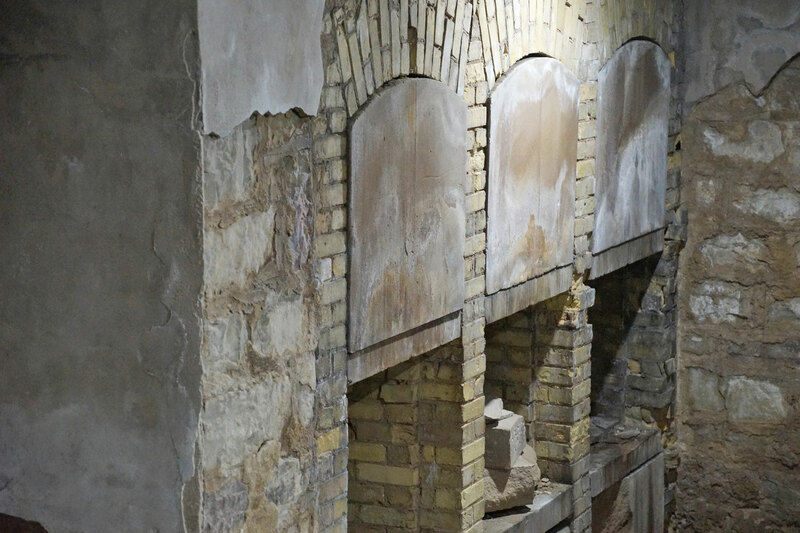 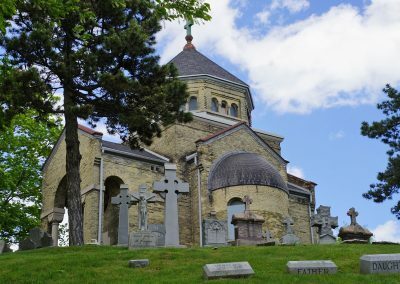 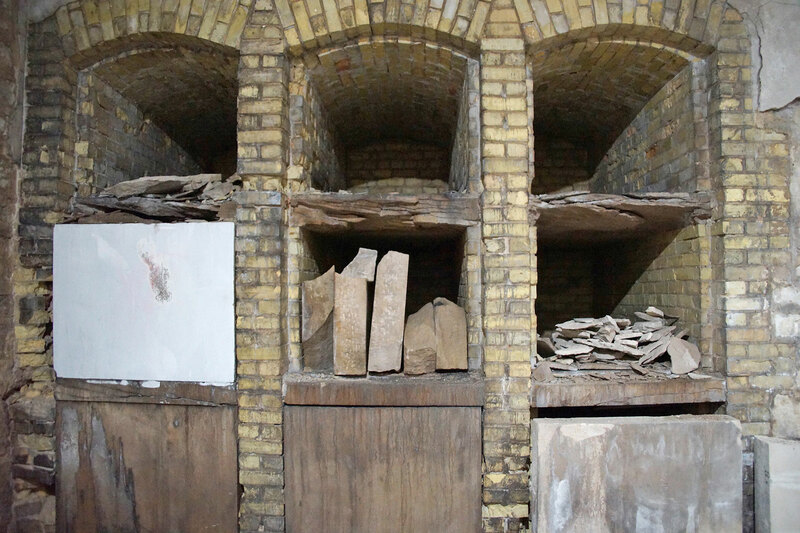 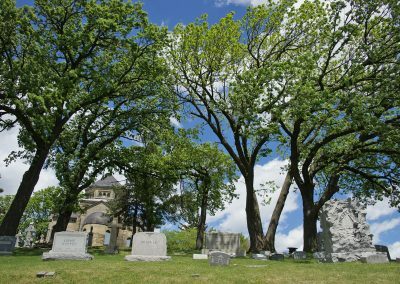 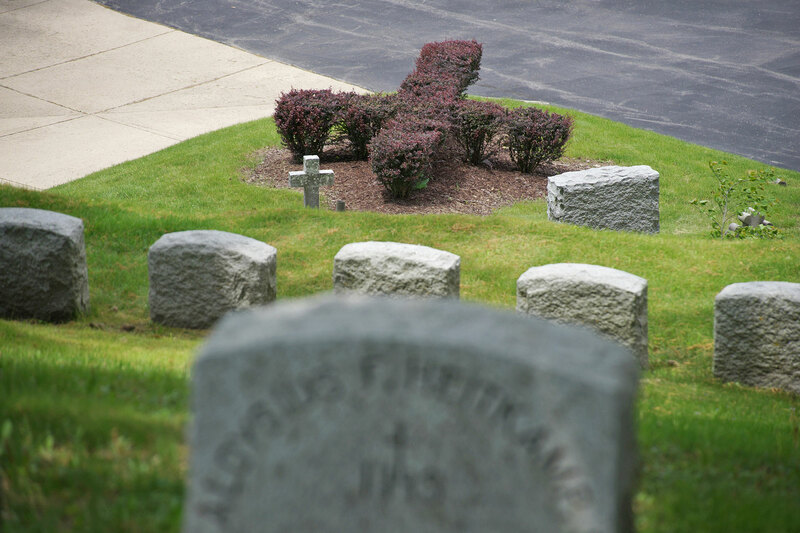 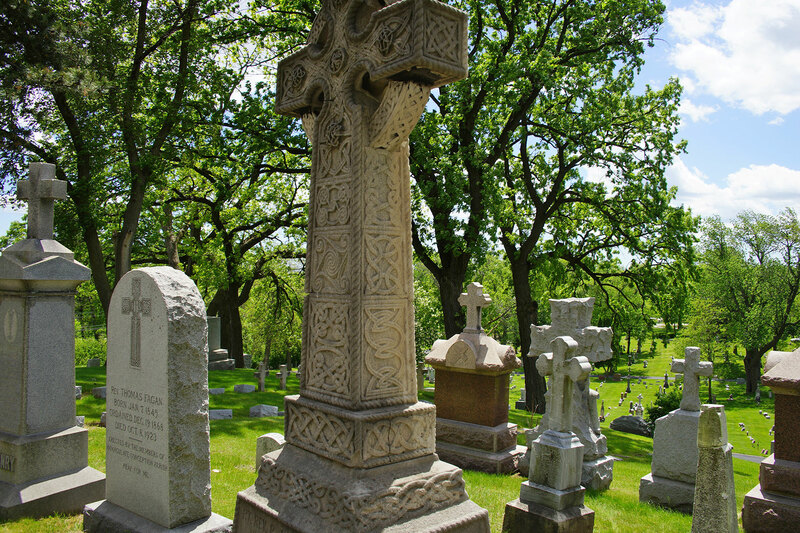 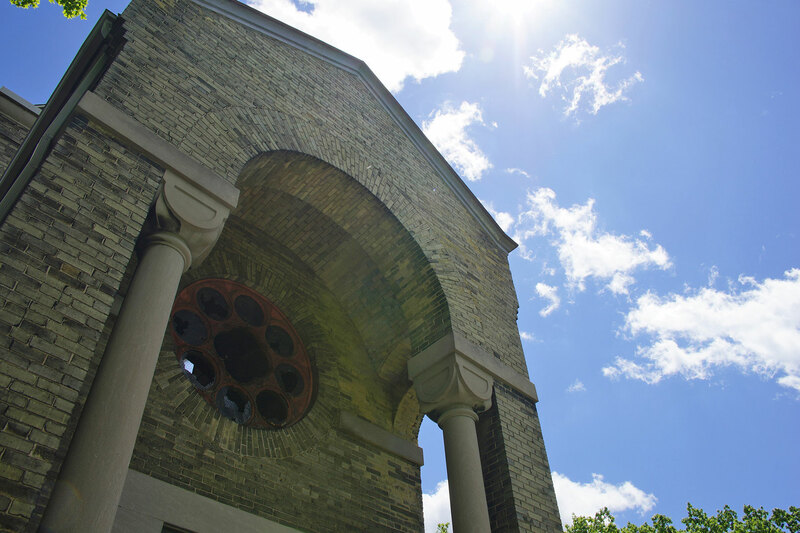 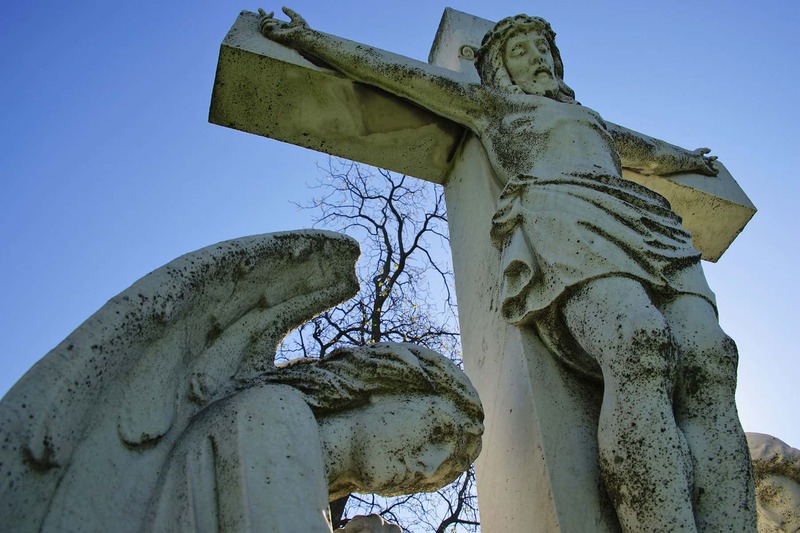 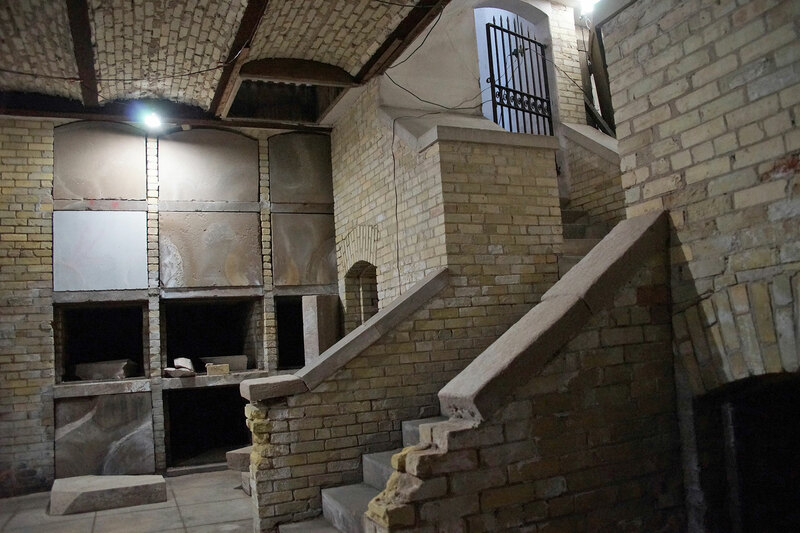 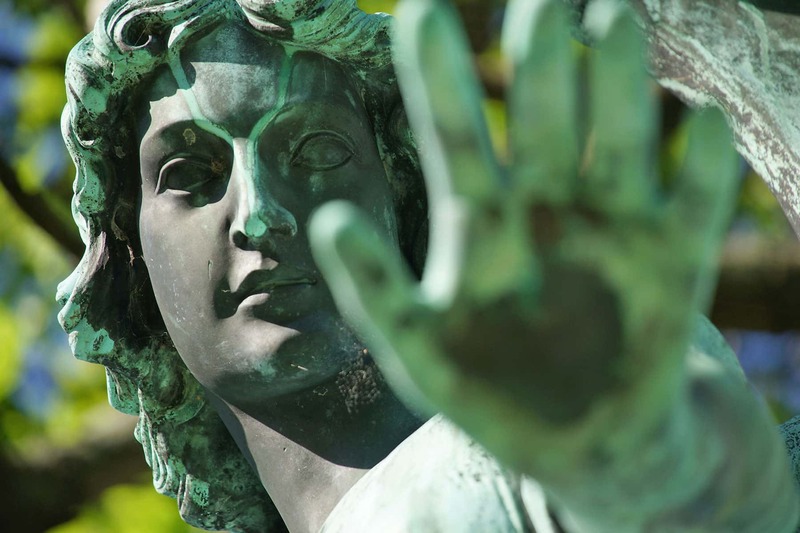 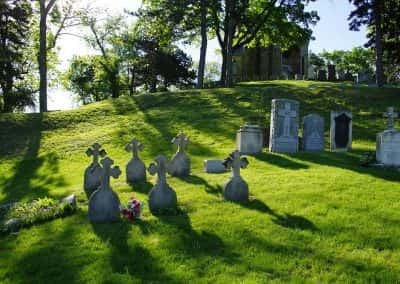 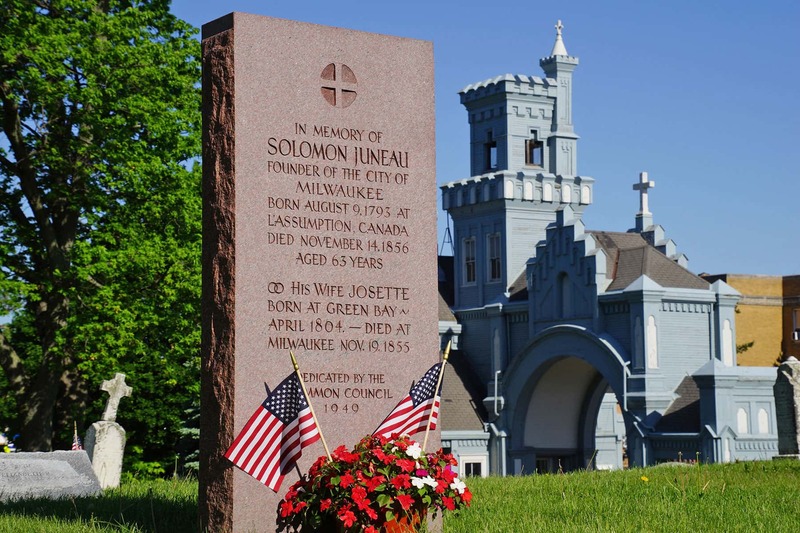 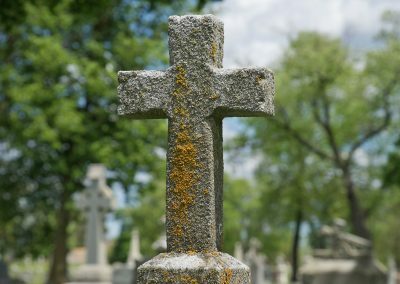 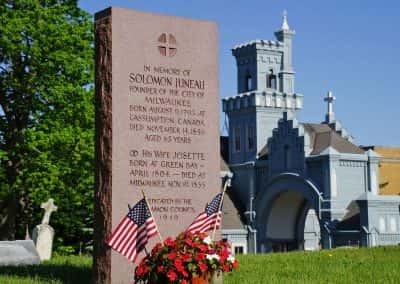 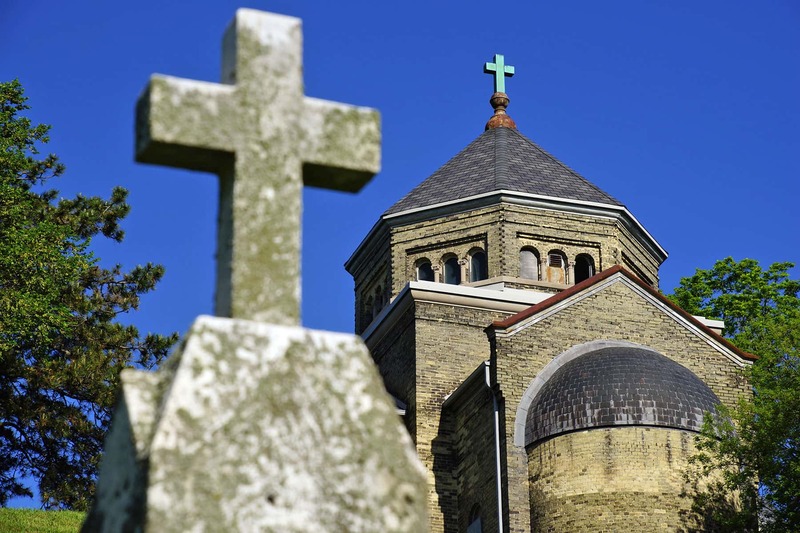 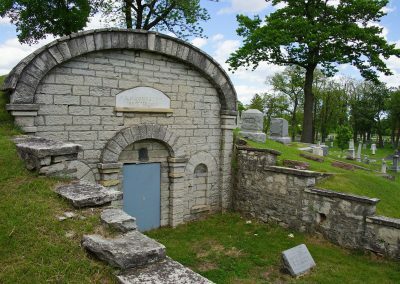 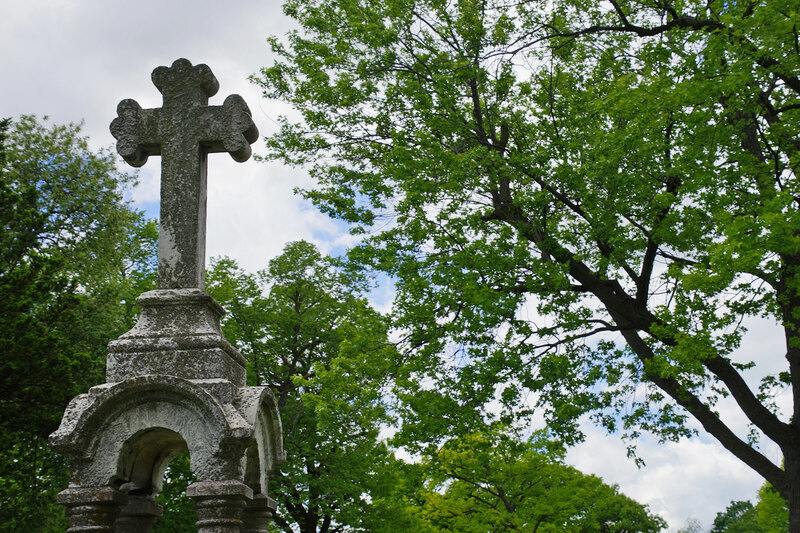 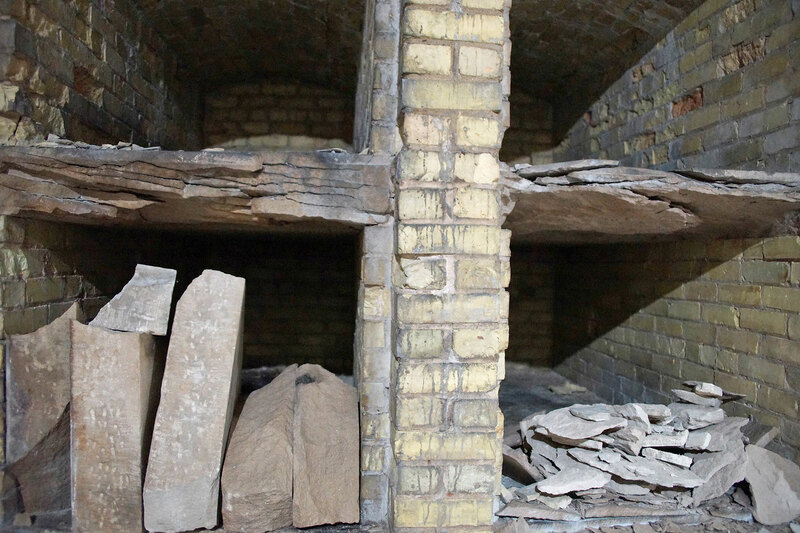 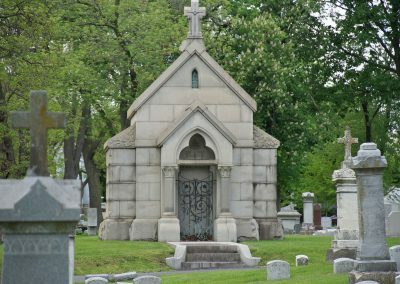 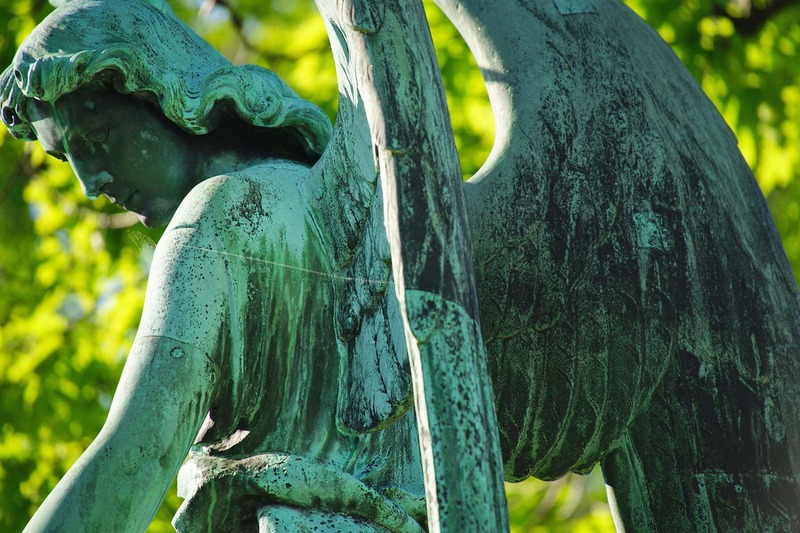 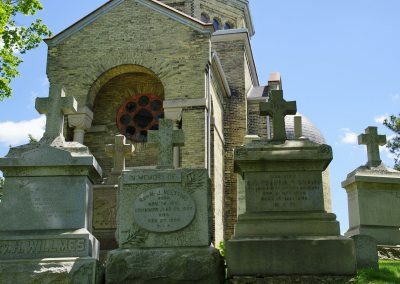 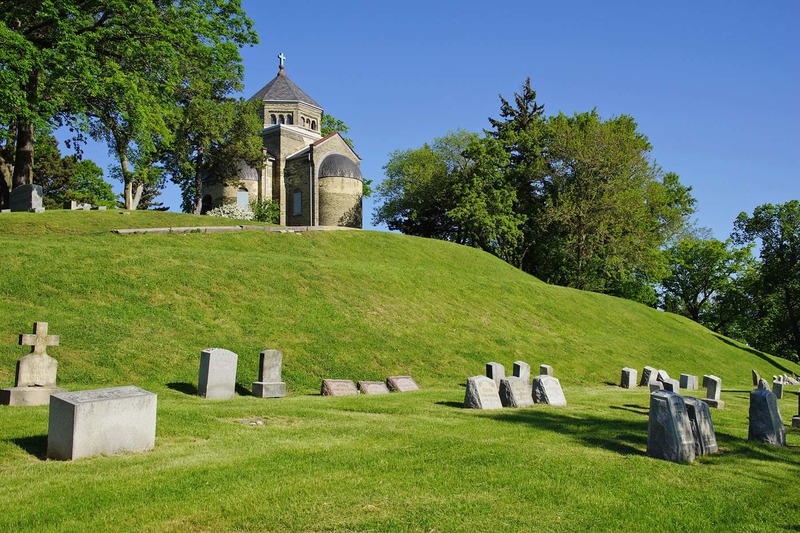 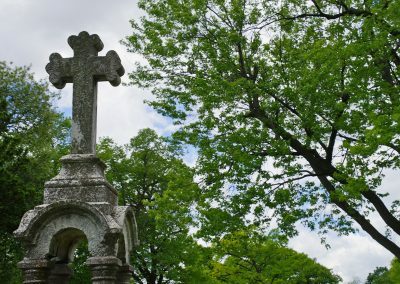 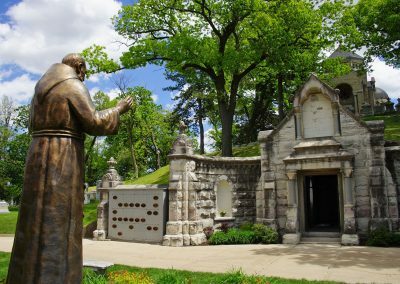 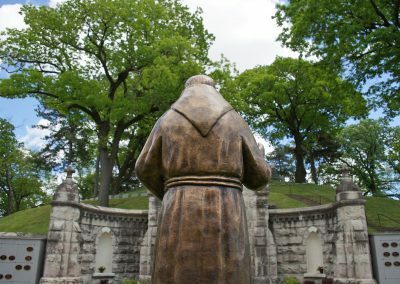 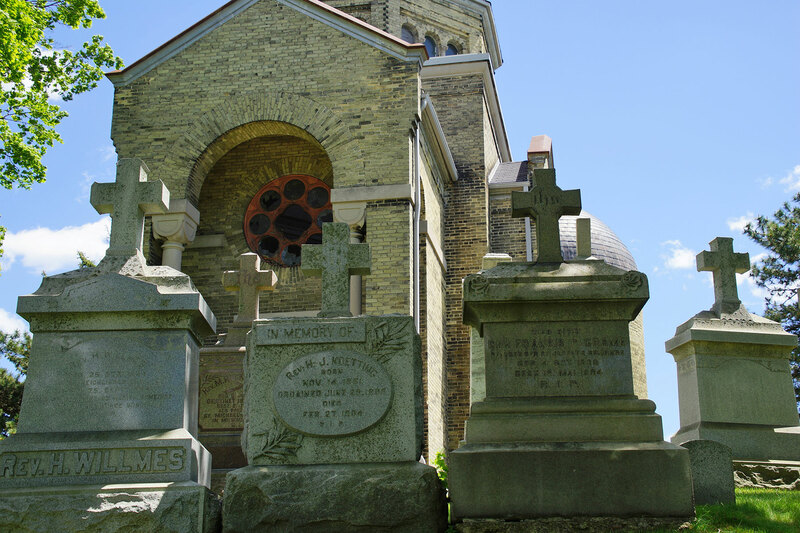 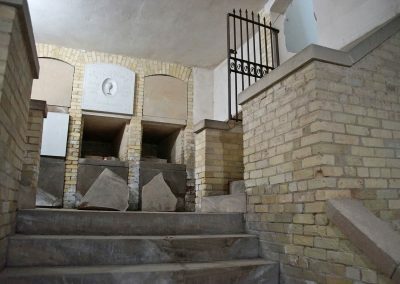 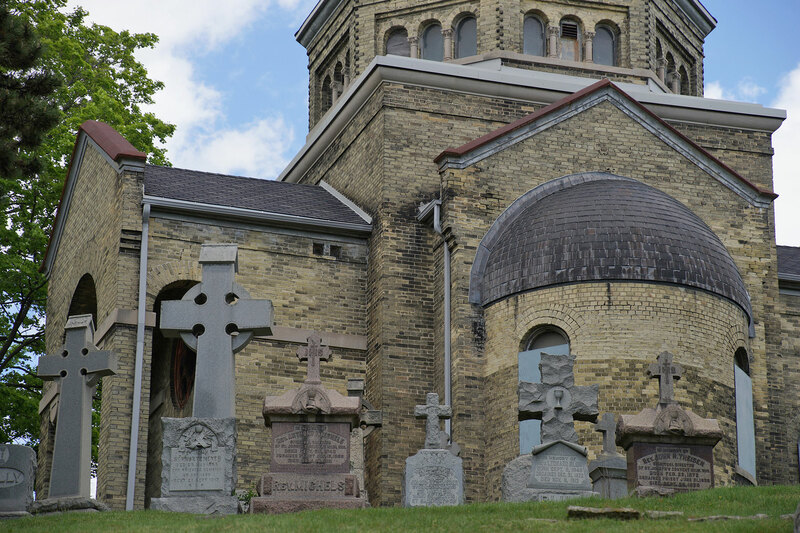 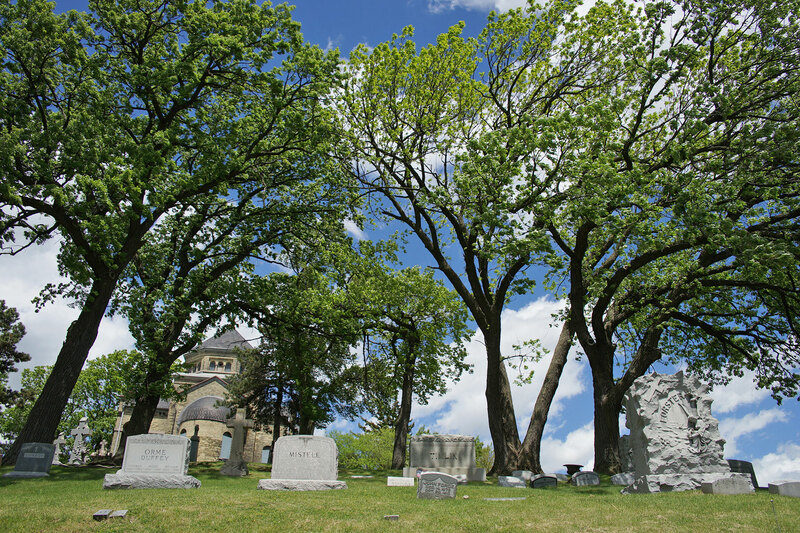 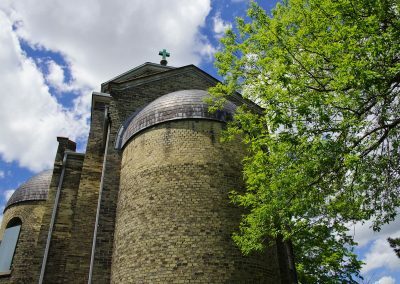 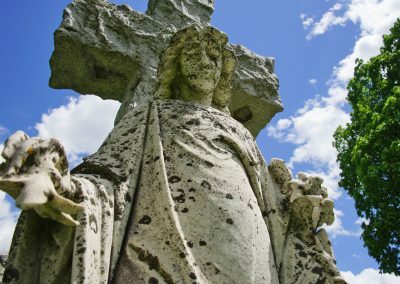 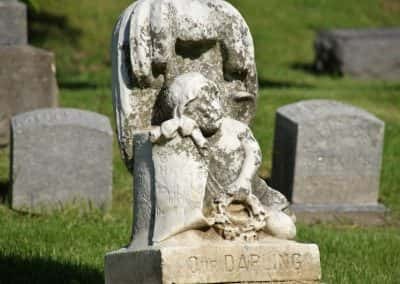 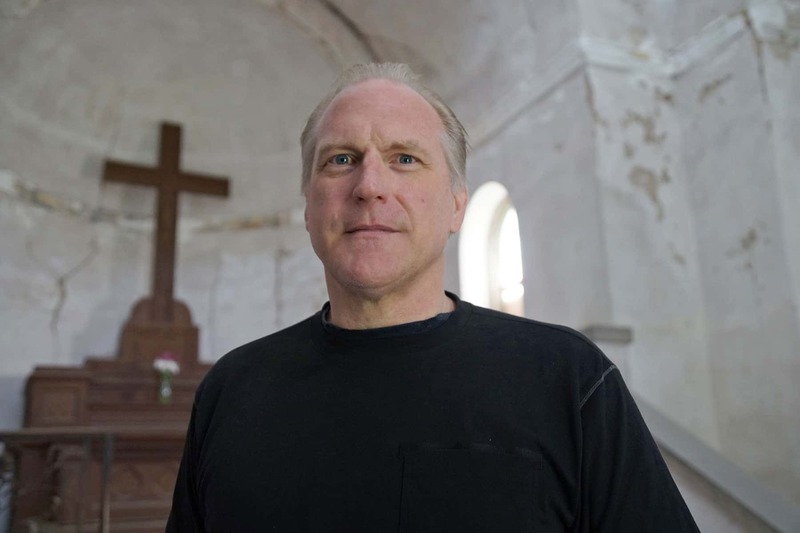 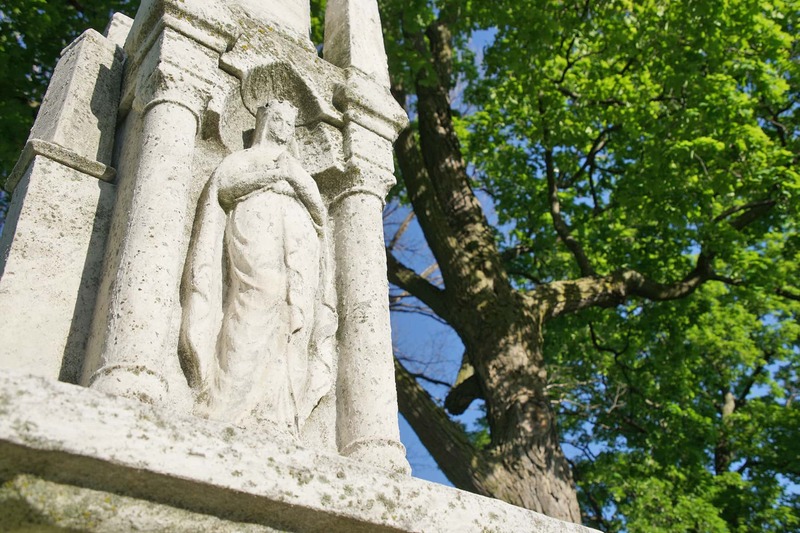 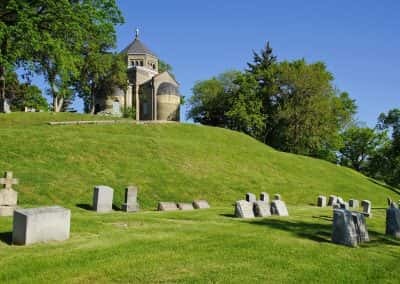 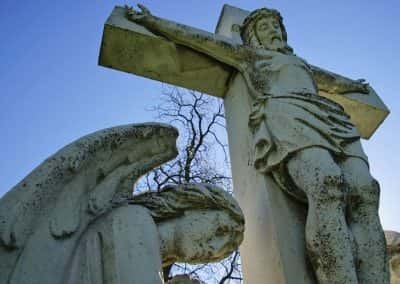 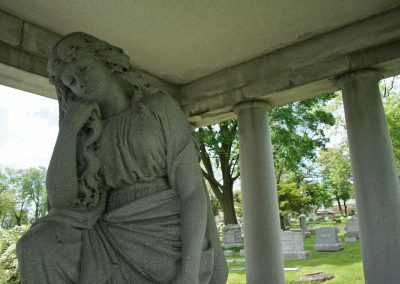 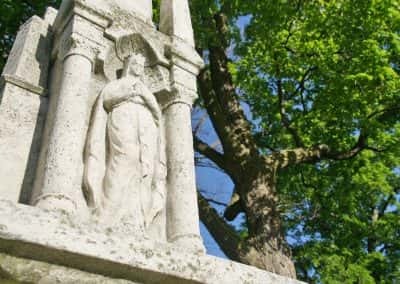 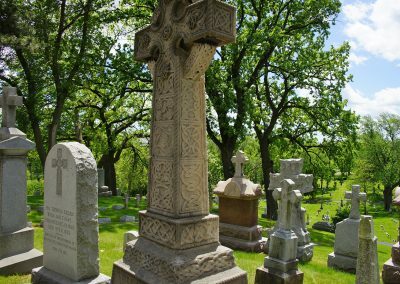 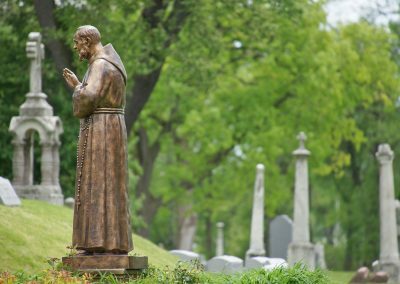 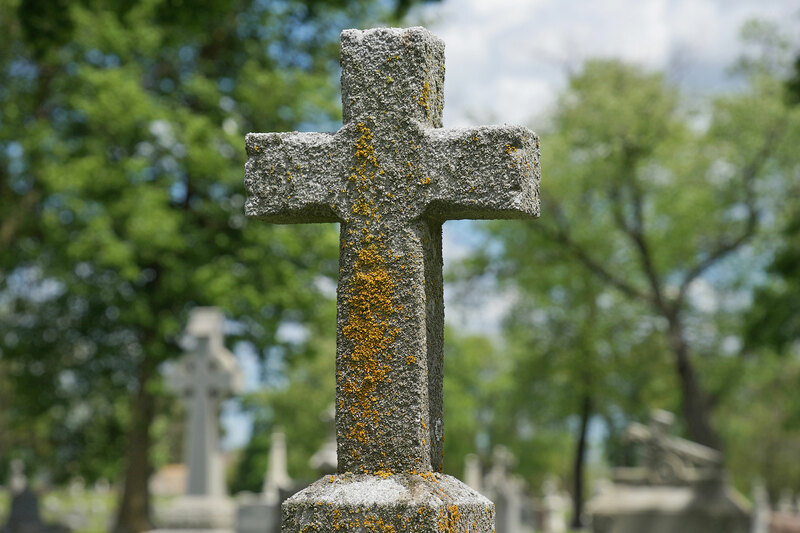 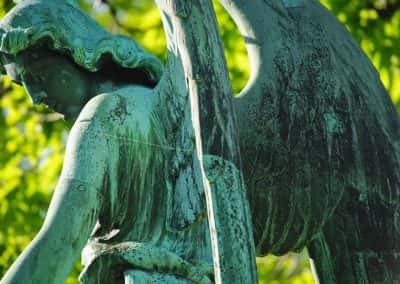 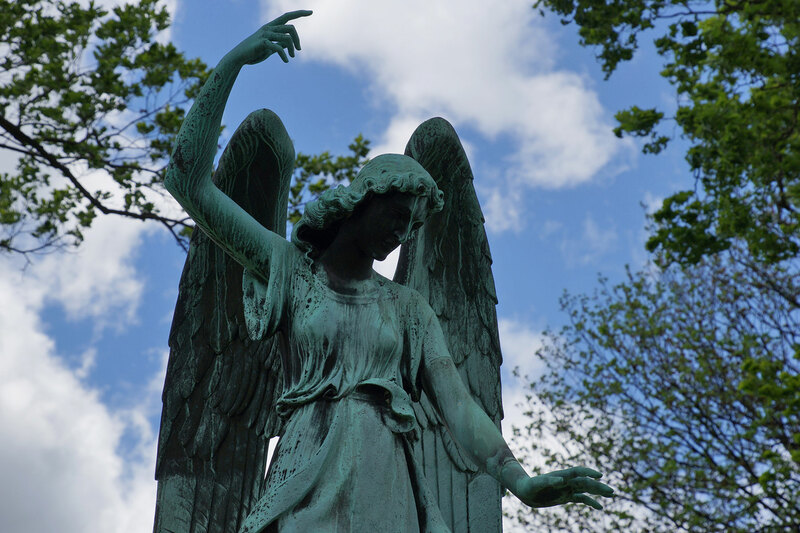 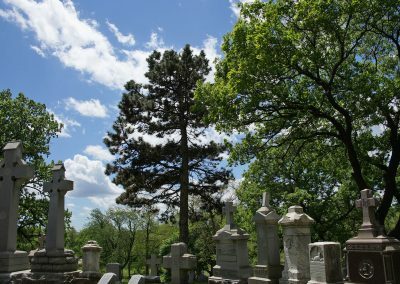 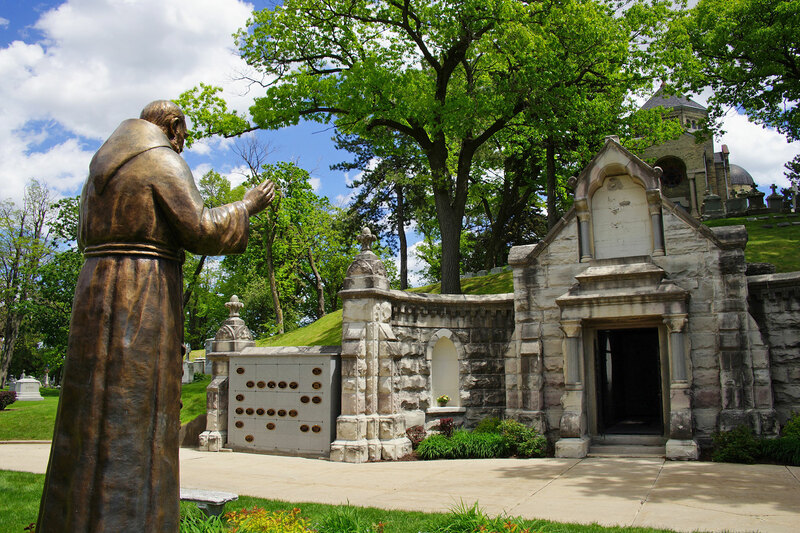 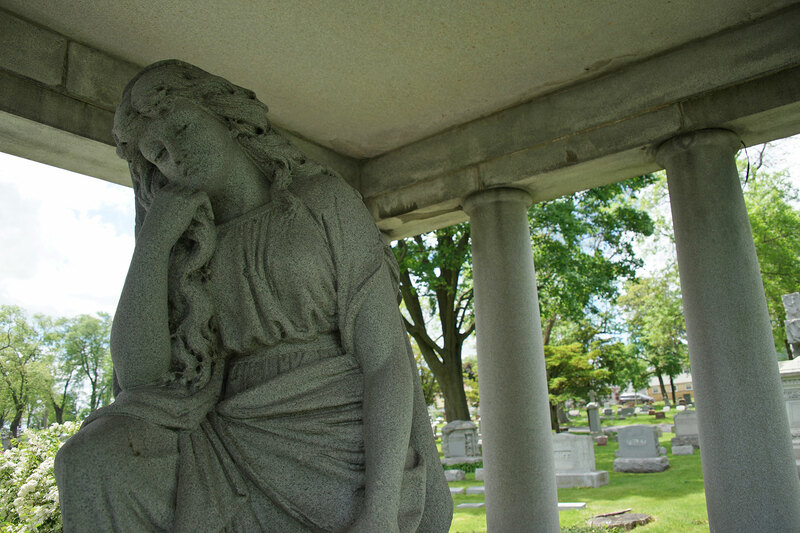 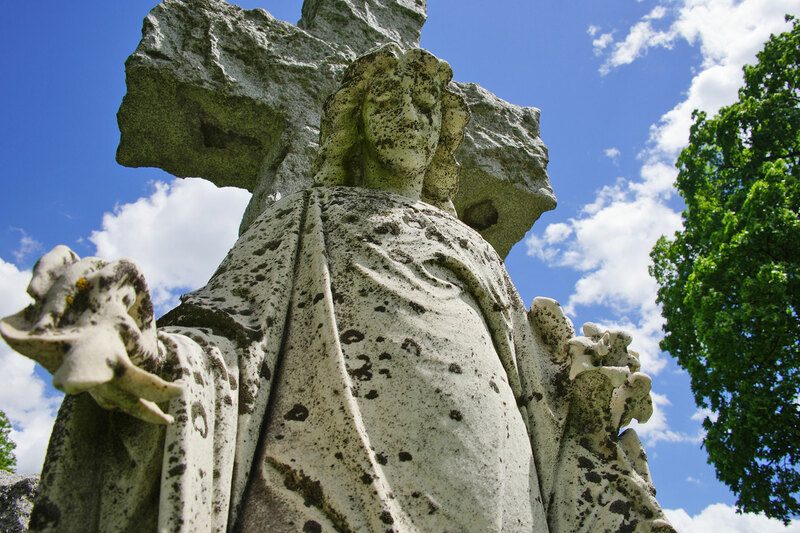 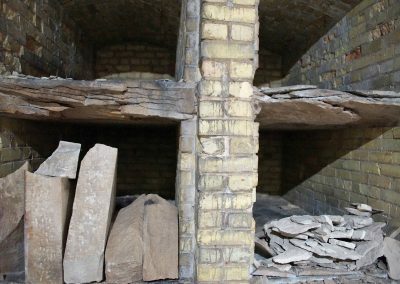 Because the chapel in Calvary Cemetery was a designated historical landmark, the Catholic Archdiocese of Milwaukee had to petition the Milwaukee Historic Preservation Commission for a permit to demolish it. 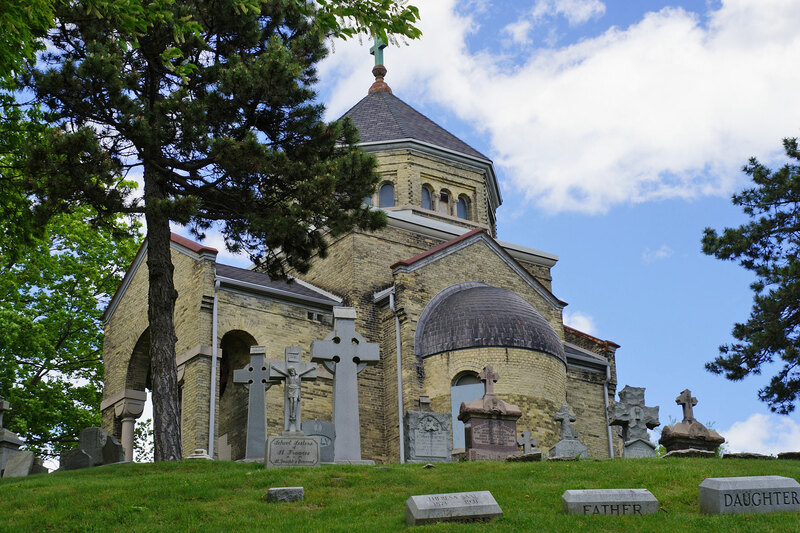 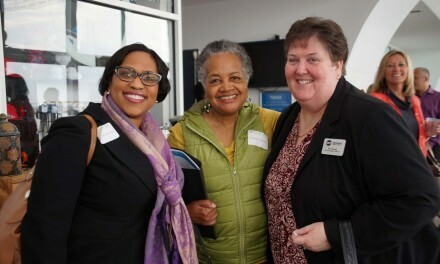 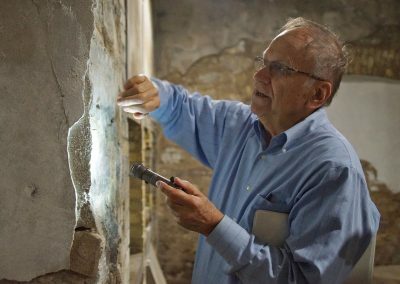 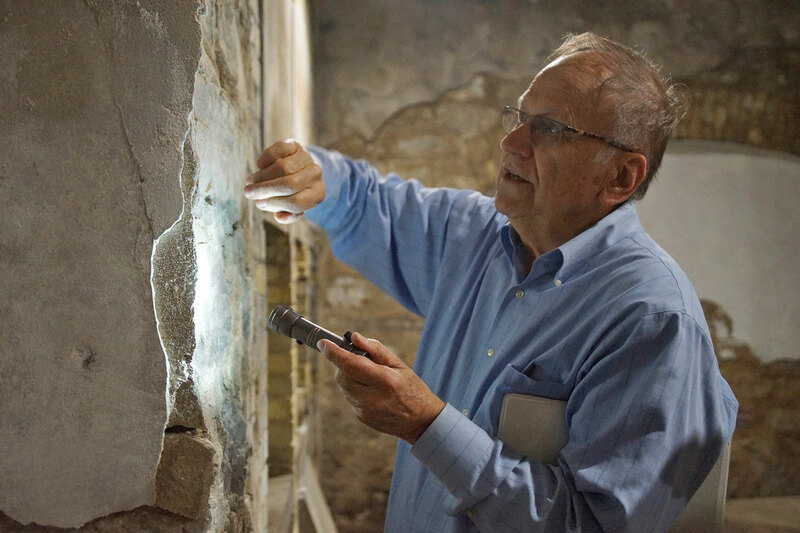 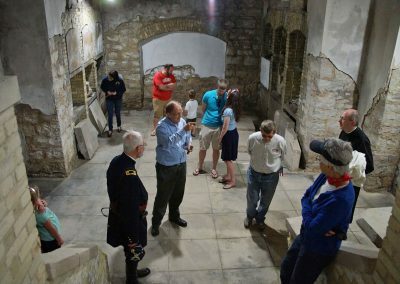 The Friends of Calvary Cemetery, a group of interested local citizens, viewed the chapel as an historical treasure to be preserved. 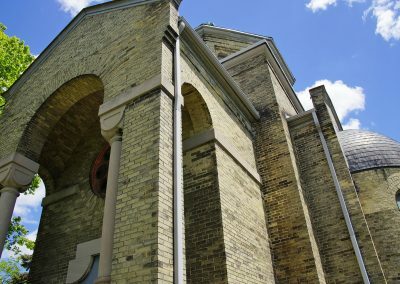 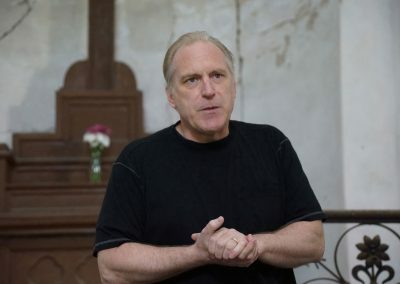 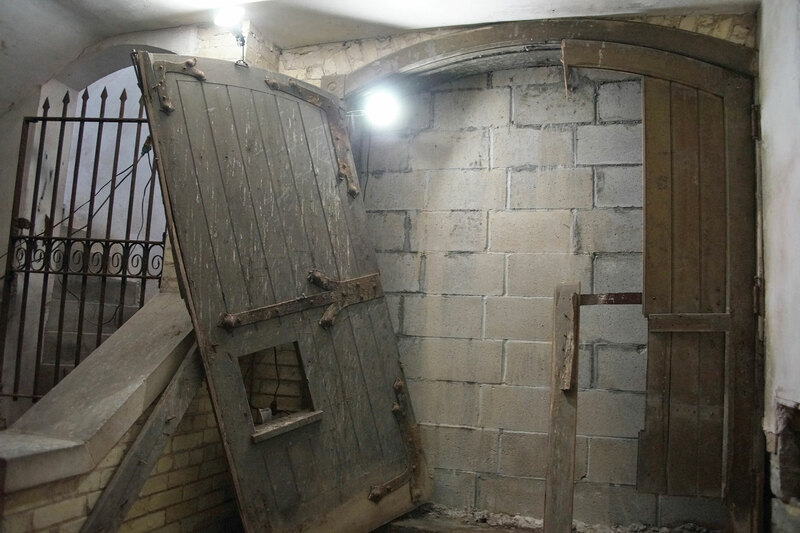 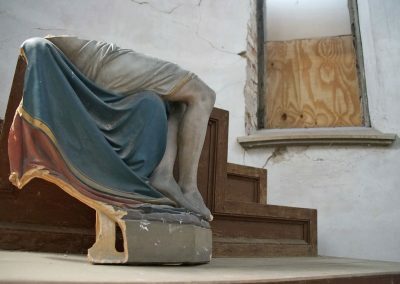 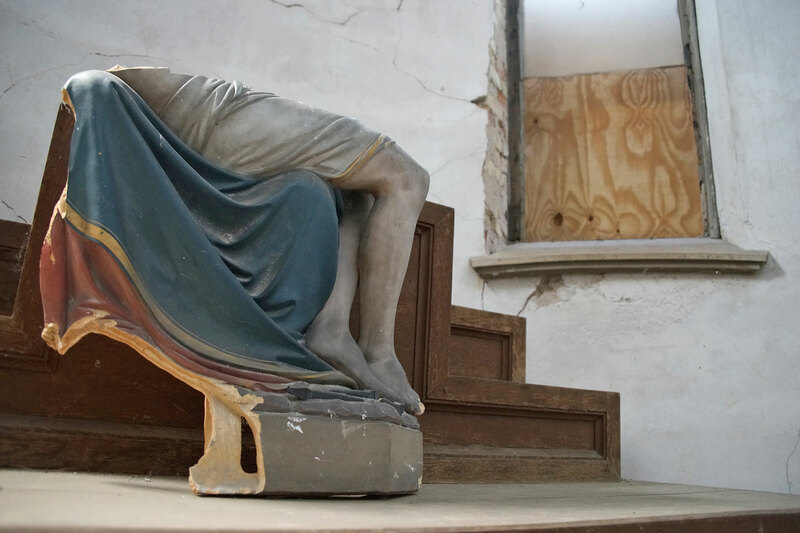 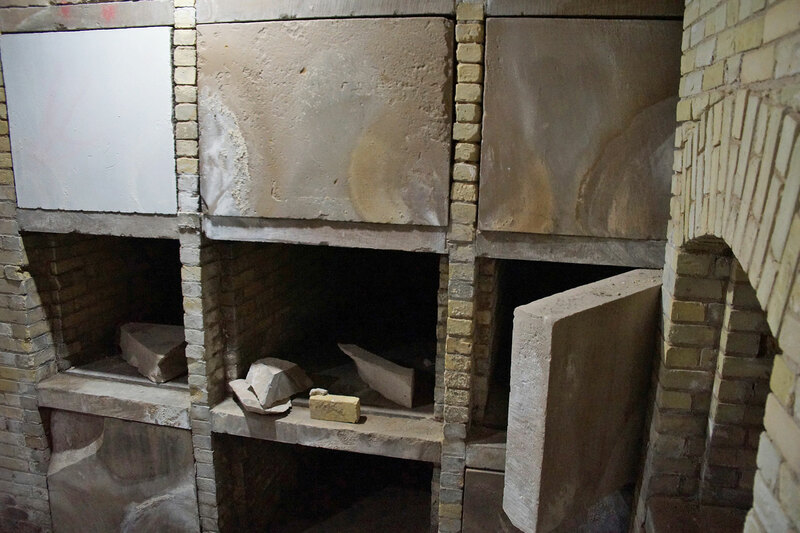 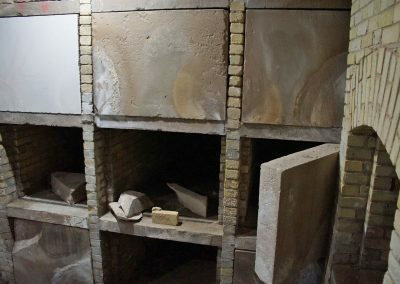 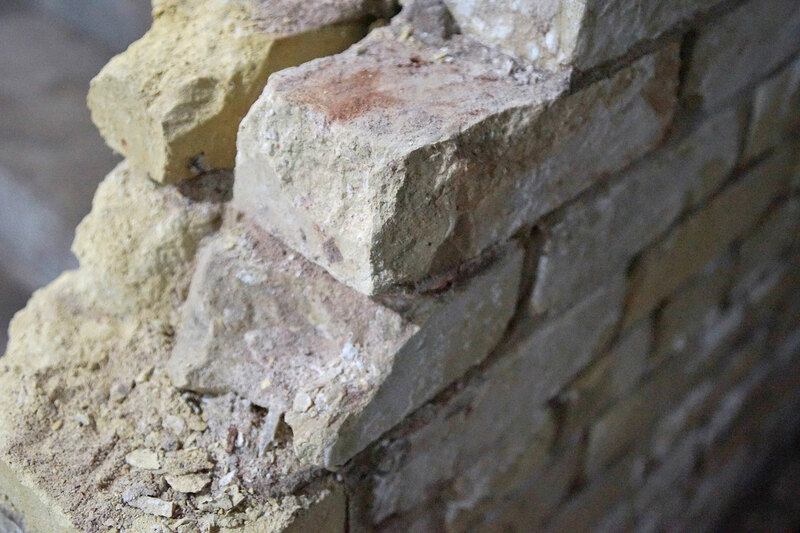 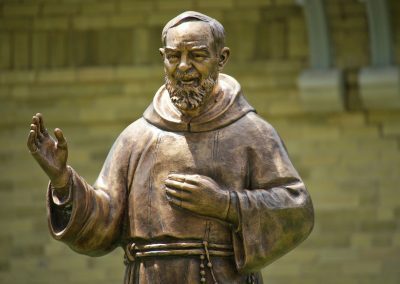 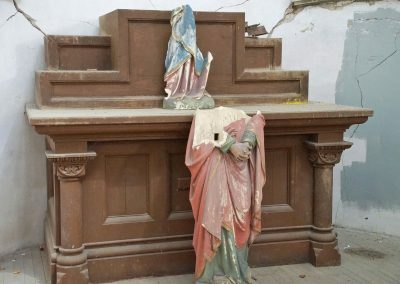 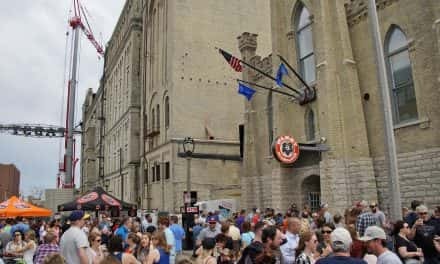 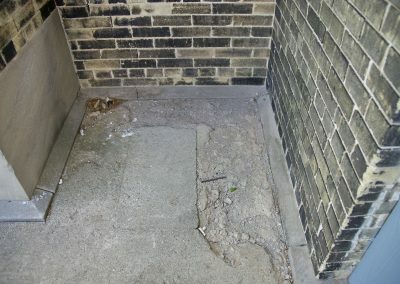 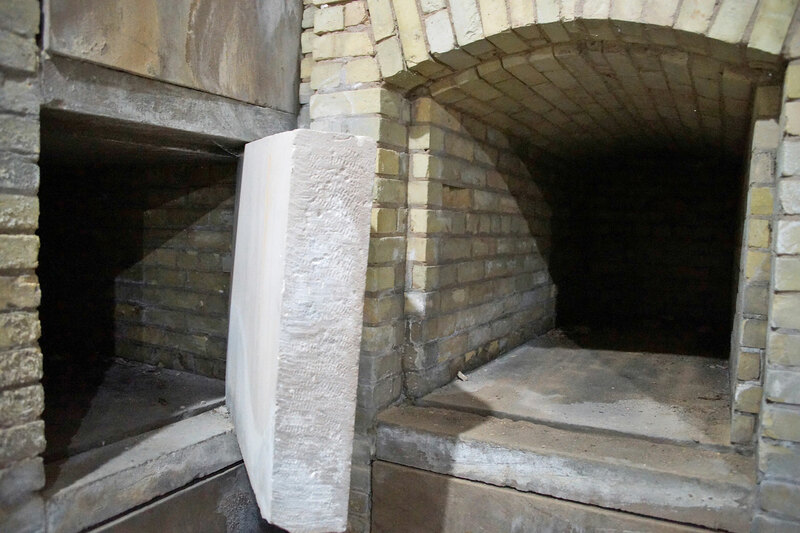 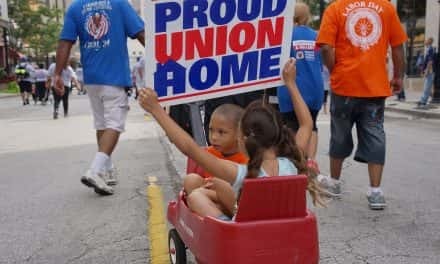 By early 1993 they convinced the Archdiocese to withdrew the petition, and the group began a long and slow process of overseeing significant restoration work. 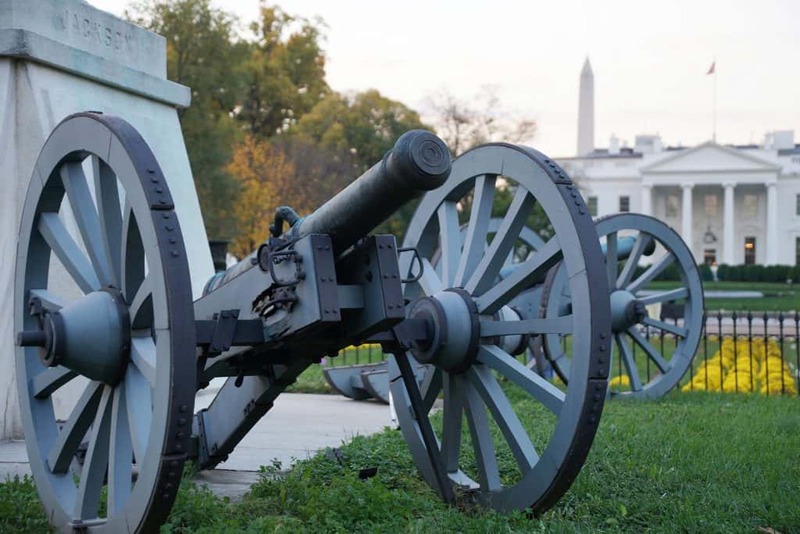 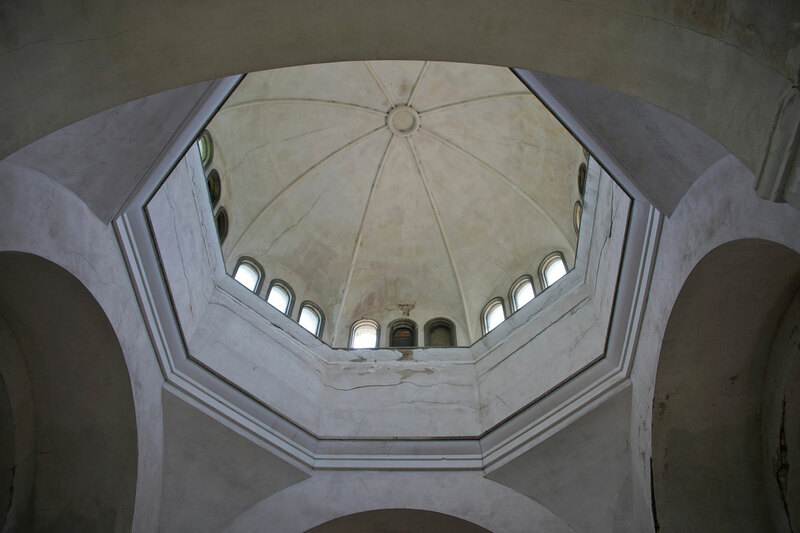 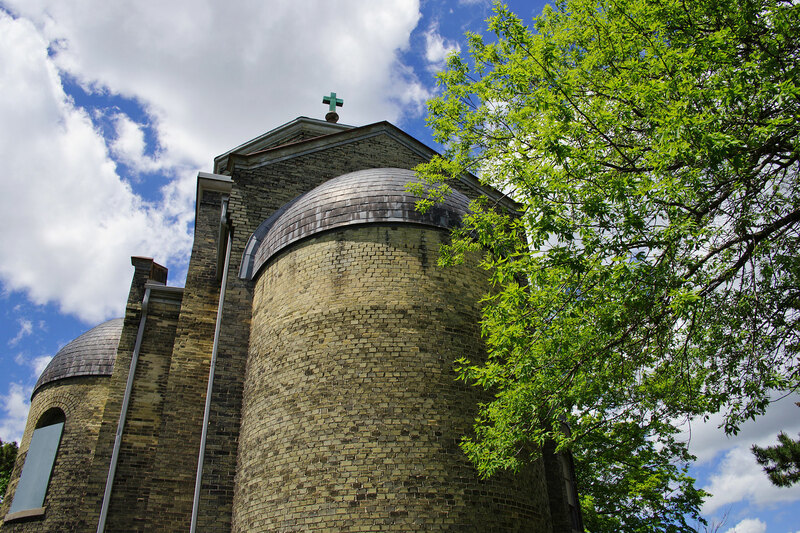 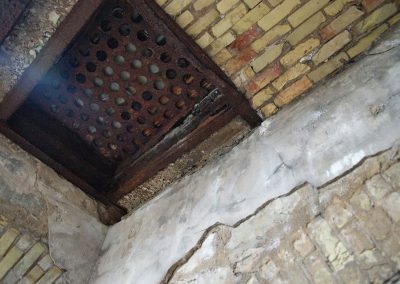 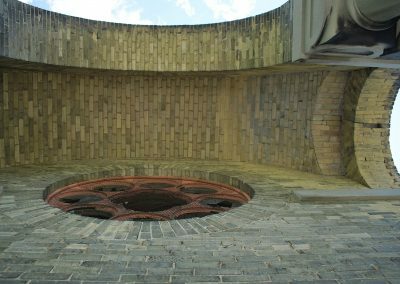 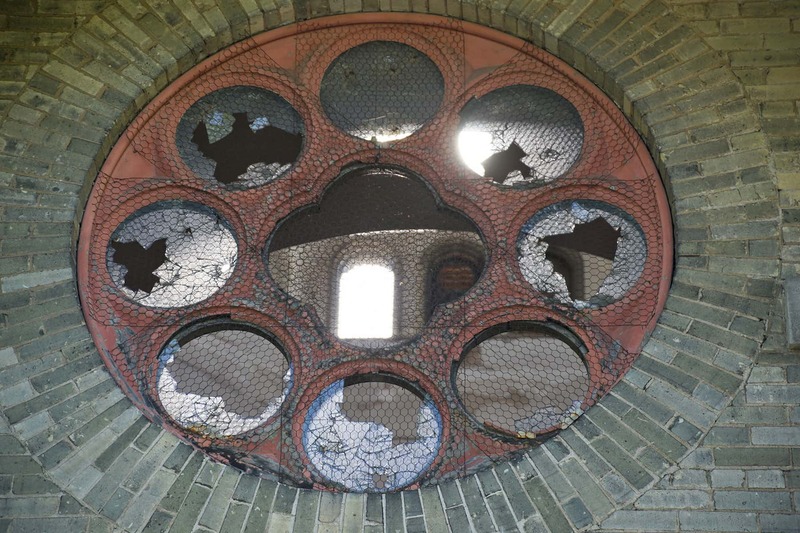 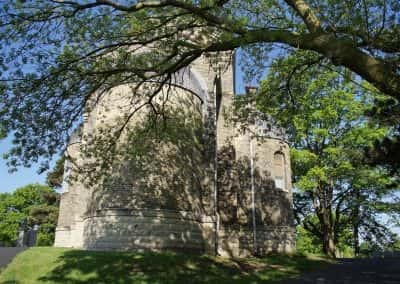 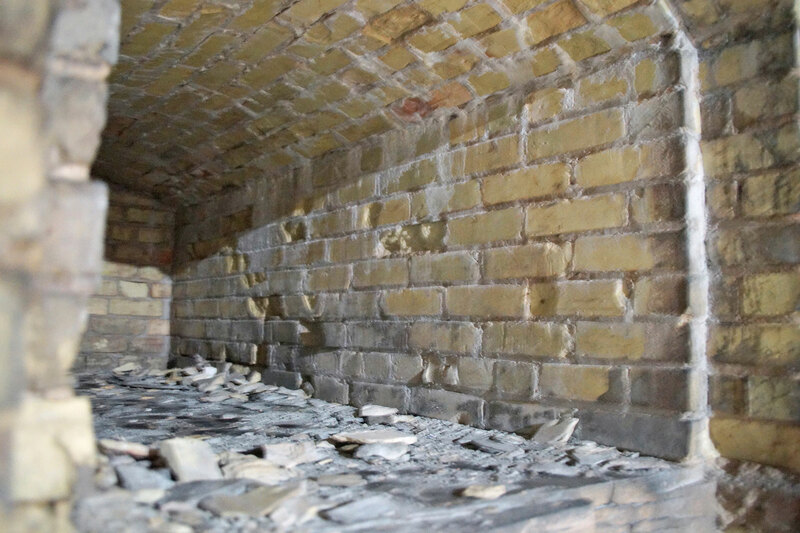 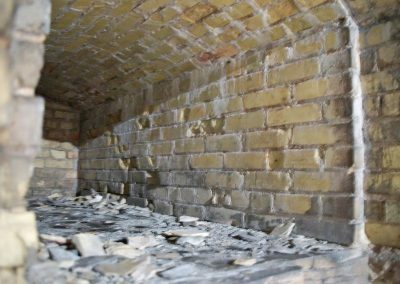 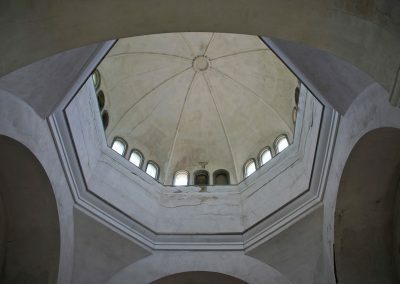 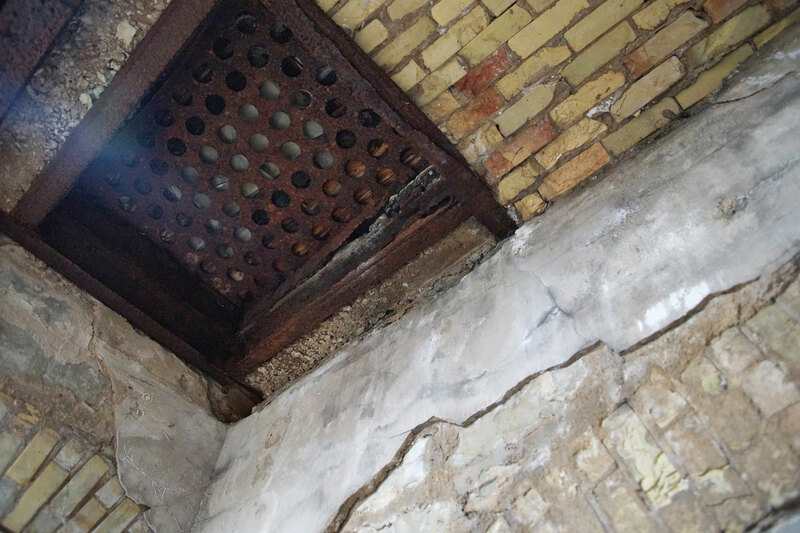 Three crumbling half-domes were restored by rebuilding the brickwork and re-roofing them with highly-durable nickle-coated copper, and the central dome was fully rebuilt due to its lightning damage. 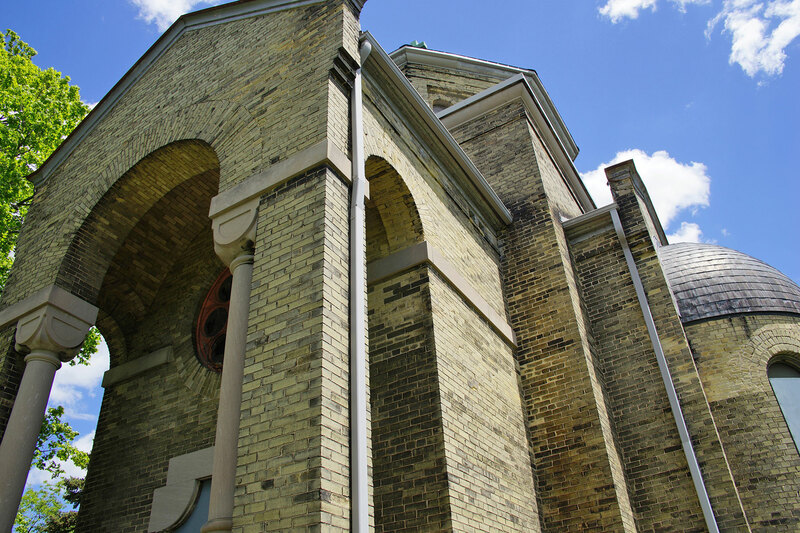 With the roof work completed, the next step in the process is installing new windows.